Staff member, Alyssa Radzwion and volunteer, Dawn Sun gathering seed at Charles Ilsley Park in late October. 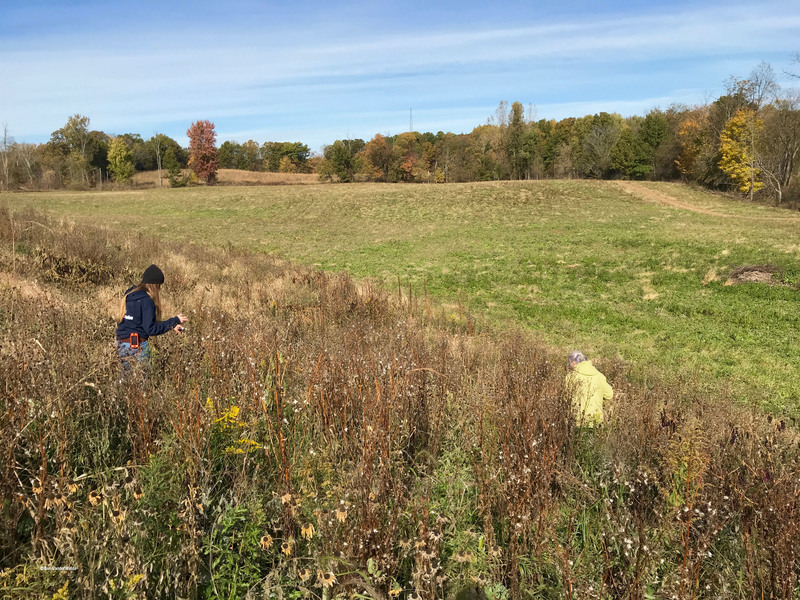 Standing hip-deep in native grasses and wildflowers is a pretty terrific way to spend a few hours on a cool autumn afternoon. 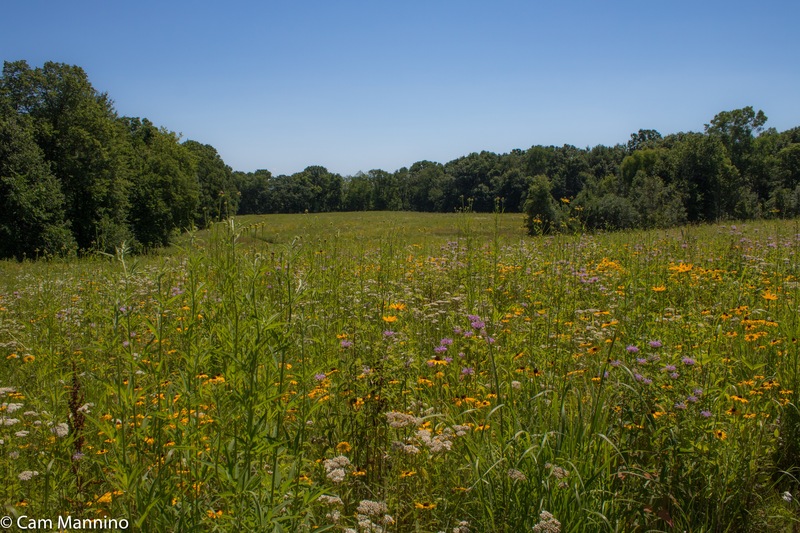 Every fall our township Natural Areas Stewardship Manager, Dr. Ben VanderWeide, plans a few days for harvesting the seeds of native wildflowers to plant in our parks over the winter and the following spring. So this October, volunteers gathered, clippers in hand, paper bags at the ready, to chat quietly as we snipped the seed heads from native prairie flowers. Can you see two of our seed-gathering volunteers in this Where’s Waldo-style photo? Two volunteers gathering native wildflower seed at Charles Ilsley Park. It always makes me feel like a child again to stand in a field with friends and have native grasses towering over us. 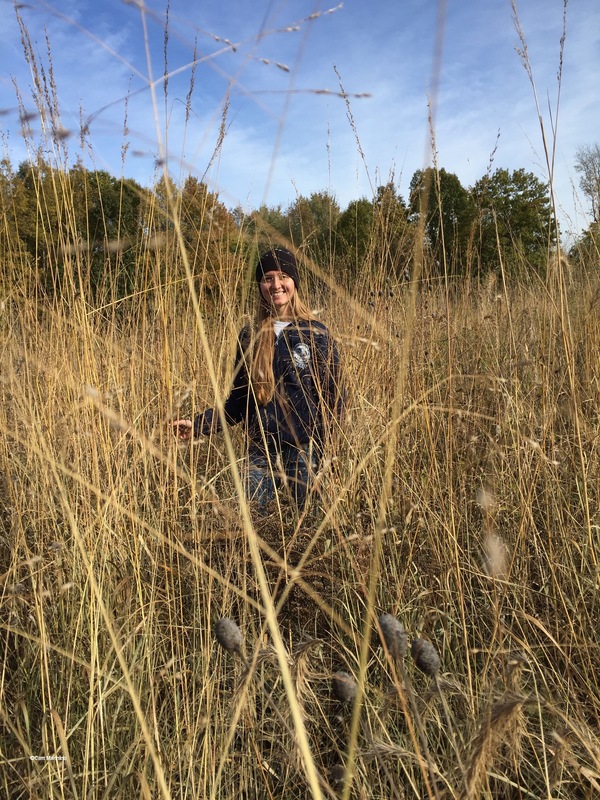 Here’s our township Stewardship Specialist, Alyssa Radzwion, smiling through a scrim of native grass. 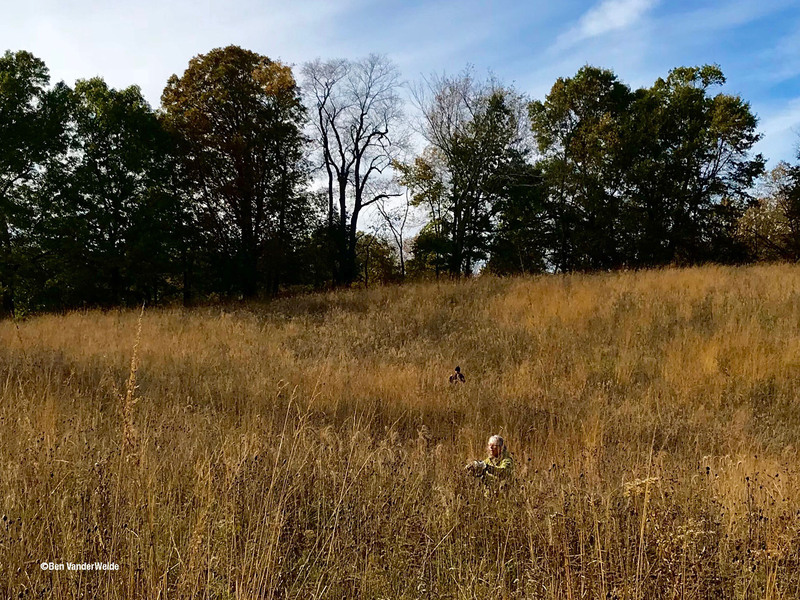 Our stewardship specialist, Alyssa, gathering gray-headed coneflower seeds among the native grasses and wildflowers at Charles Ilsley Park. 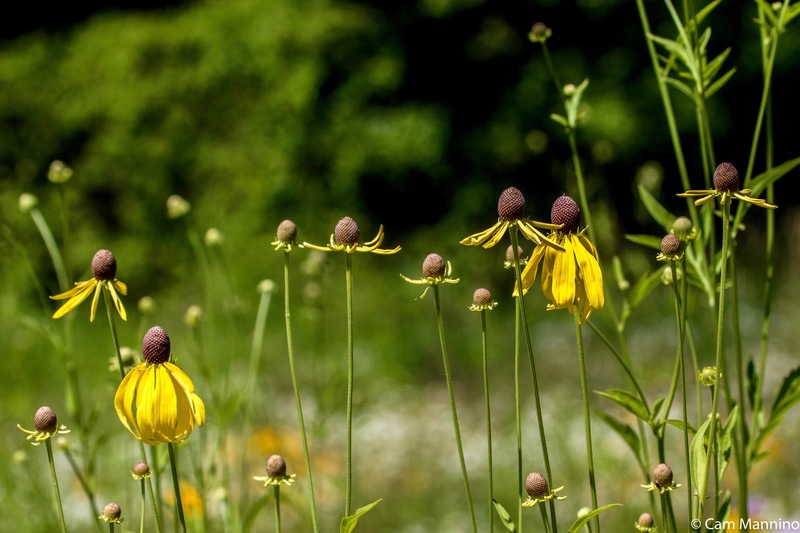 On the day pictured above, we harvested seeds from Black-eyed Susans (Rudbeckia hirta), Gray-headed Coneflowers (Ratibida pinnata), Foxglove Beardtongue (Penstemon digitalis), and several other native plants. 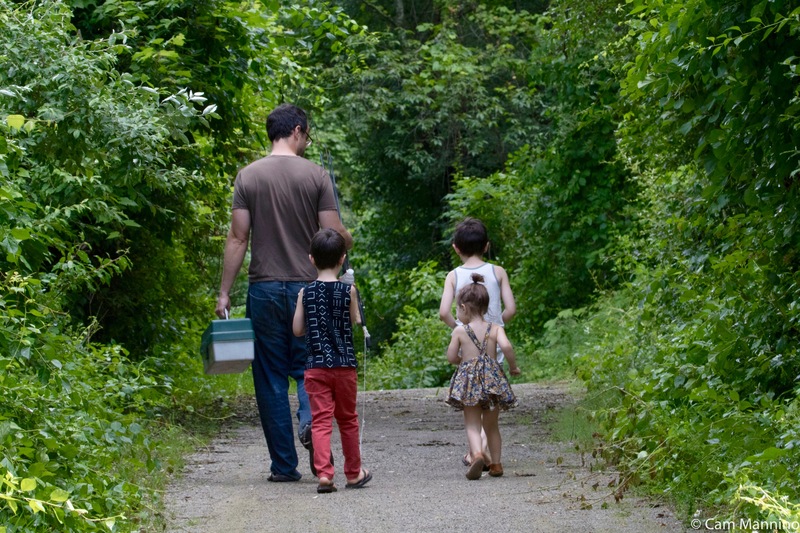 Harvesting native seeds is good stewardship. Ben instructs us volunteers to collect an appropriate amount for each species, leaving lots of seeds where they are to feed wildlife and renew our prairies so they look as glorious next spring as they did this year! 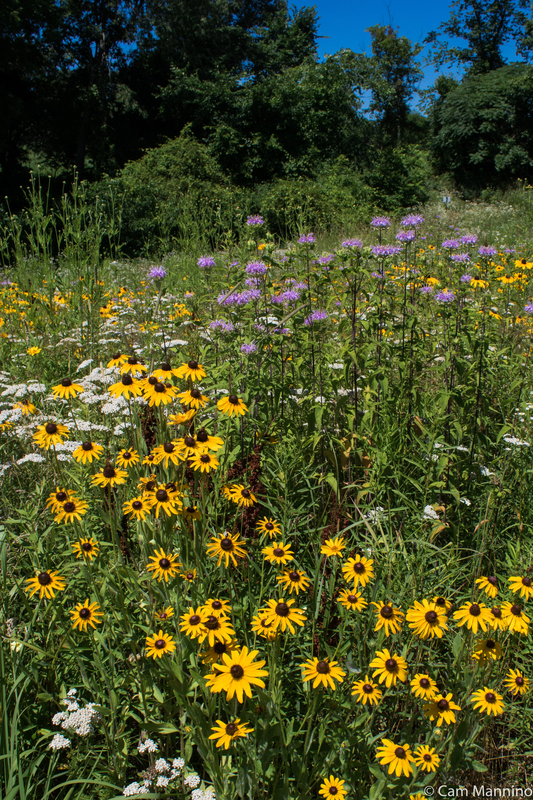 The seeds we harvest, along with purchased wildflower seed, can then help restore more of our natural areas to their former glory. All that and peaceful autumn afternoons among wildflowers and kindred spirits. Maybe you’d like to join us next year as we lend nature a helping hand? Eastern Prairie at Charles Ilsley Park, July 12, 2018. A kindly Dad taking his three young children fishing one morning at Draper Twin Lake Park. Meeting the lovely family above at Draper Twin Lake Park one morning was a fitting beginning to my walk. This dad was kept very busy baiting hooks and unhooking Blue Gills for his three young children who were excited to take their catch home and “eat ’em.” Well, the avian parents this week are as busy as that dad. Many fledglings are out of the nest but not quite “ready for prime time.” The youngsters’ flights are still a bit awkward, they haven’t quite grown into their beaks, and they object to being weaned from feedings by mom and dad. They crouch on branches, trying to look helpless by quivering their wings and begging “Feed Me!” with loud, high-pitched and incessant chirping. 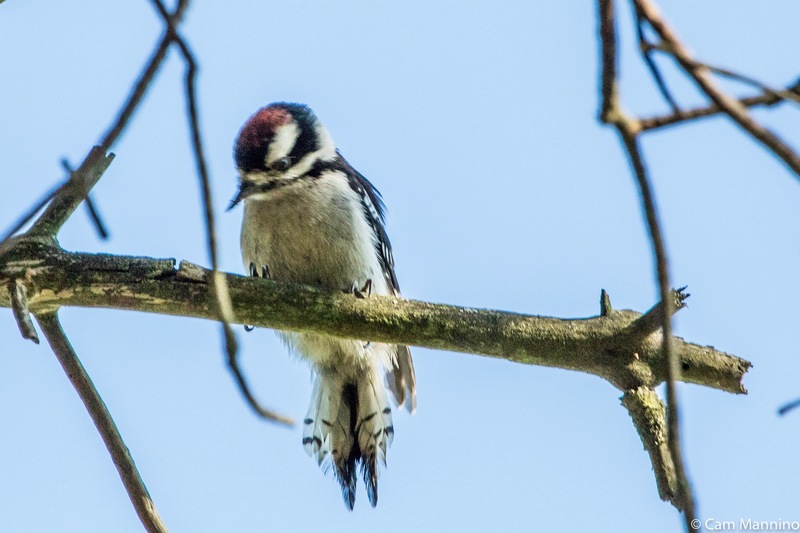 The conscientious adult birds are busy plucking berries, ferrying caterpillars and crunching seeds to fill young beaks. Meanwhile, more summer butterflies and other insects appear each day as native and non-native flowers line the trails and bloom in the wetlands. 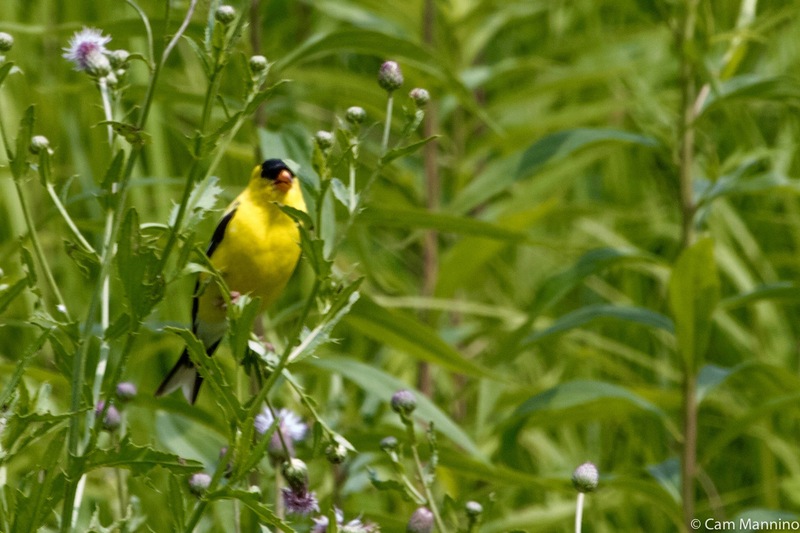 Summer, the busy season for nature, is well underway. Industrious Parent Birds and Their Demanding Offspring! 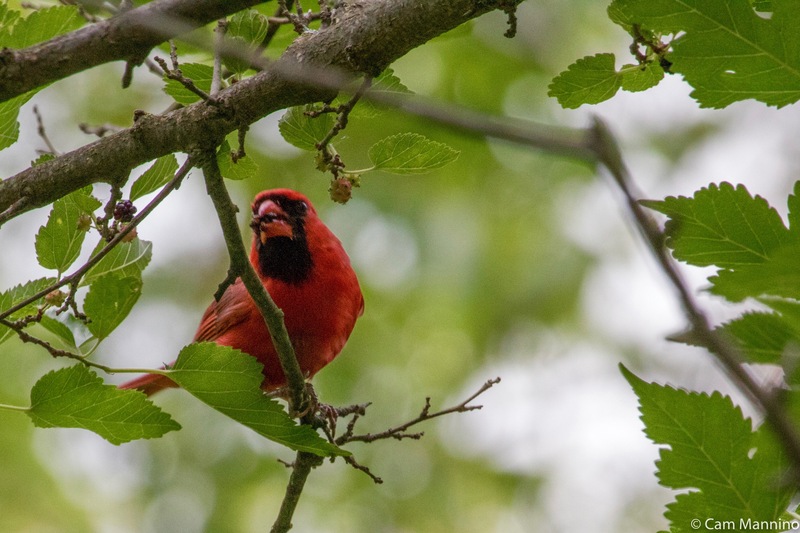 Twice as I entered the western path to the lake, I spotted a male Northern Cardinal (Cardinalis cardinalis) plucking little fruits from a bush and feeding them to his offspring. Juvenile cardinals have coloring similar to the female, except that their beaks are dark brown instead of red-orange like both adults. This hiding youngster couldn’t resist one peak at me over the tops of the greenery. Juvenile cardinals have coloring similar to the female, except her beak is red-orange and the youngsters’ beaks are black. 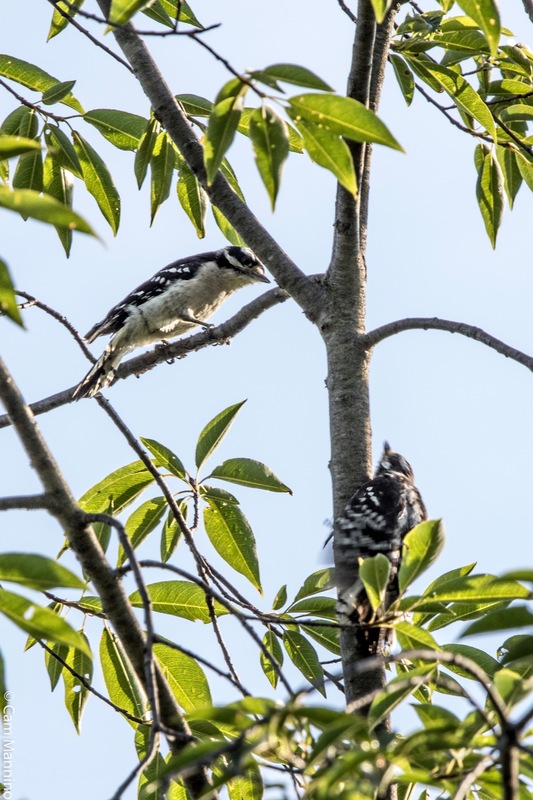 A juvenile Downy Woodpecker crouches and flutters in the classic begging style of baby birds looking to be fed. 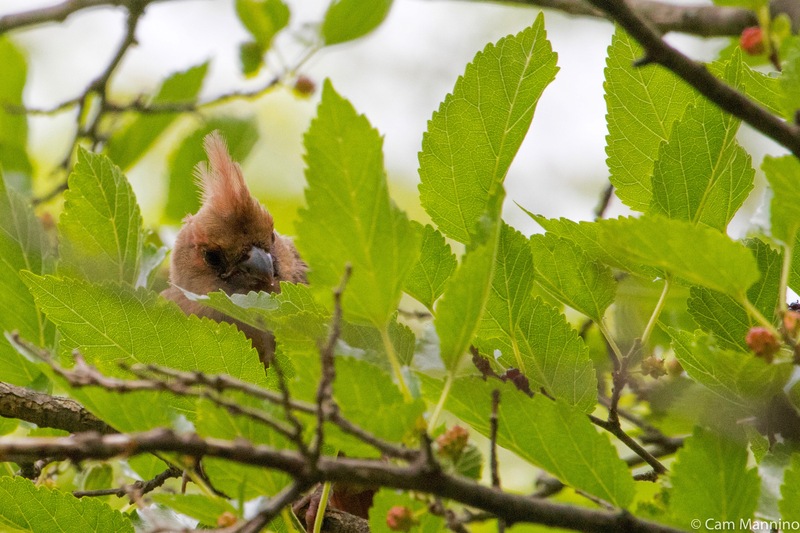 Once mom took off, the youngster, its juvenile red cap on display, practiced a bit of upside-down branch hopping. 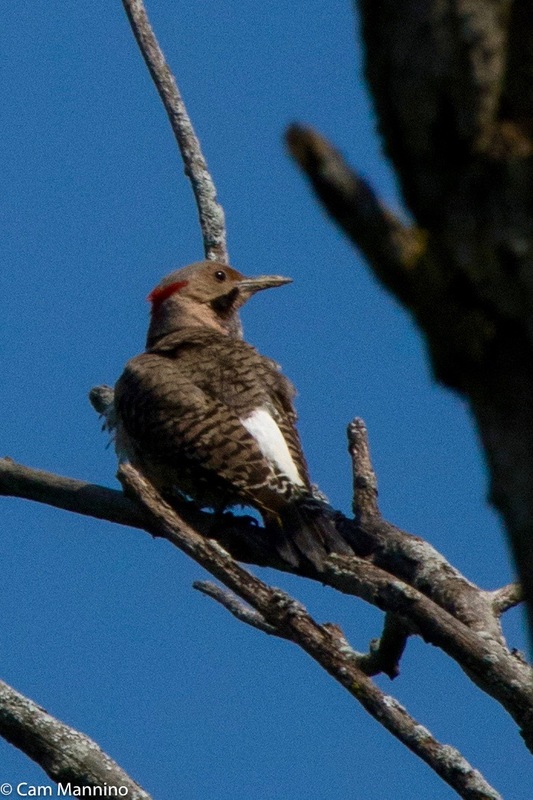 Juvenile Downy Woodpeckers have small red caps. Adult females have no red on the head and males end up with only a red dot at the back of the head. A male Common Yellowthroat (Geothlypis trichas) sang an abbreviated version of his “Witchedy, witchedy” song repeatedly in a snag over the marsh. Farther up the path, I’d seen a young female hiding in a large bush, but it didn’t stop moving long enough for a good shot, I’m sorry to say. It has the slightly askew, downy look of a young bird. 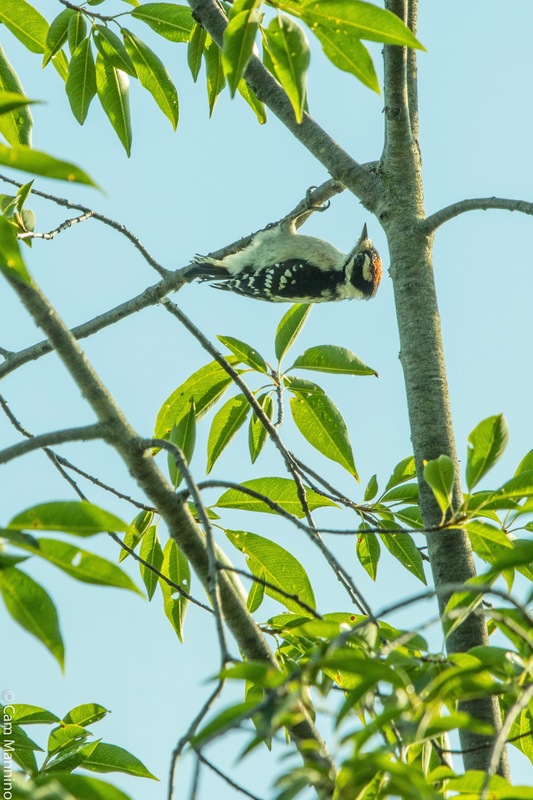 Thanks to Natural Areas Stewardship Manager Ben VanderWeide and expert birder Ruth Glass for identifying this little one for me! And to Bob Bonin for his fine photo of a fully fledged adult female so you can see how the little female will eventually look. In another snag by the lake, a mother Red-bellied Woodpecker (Melanerpes carolinus) was busy feeding her nestling(s), traveling back and forth and stretching into the hole to feed whoever was inside. Those babies should be very safe in this nice deep hole in their lakeside dead tree! 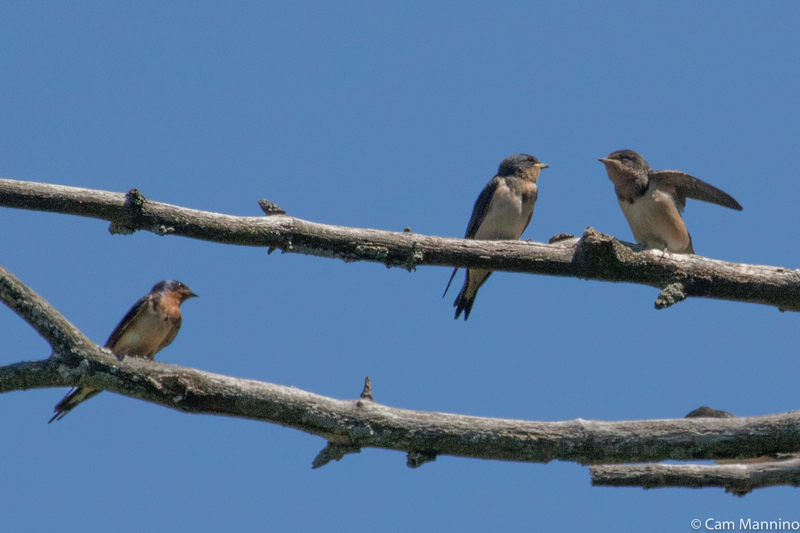 Over in the eastern part of Draper Park, I was greeted by two fledgling Barn Swallows (Hirundo rustica) sitting on a wire by the parking lot. 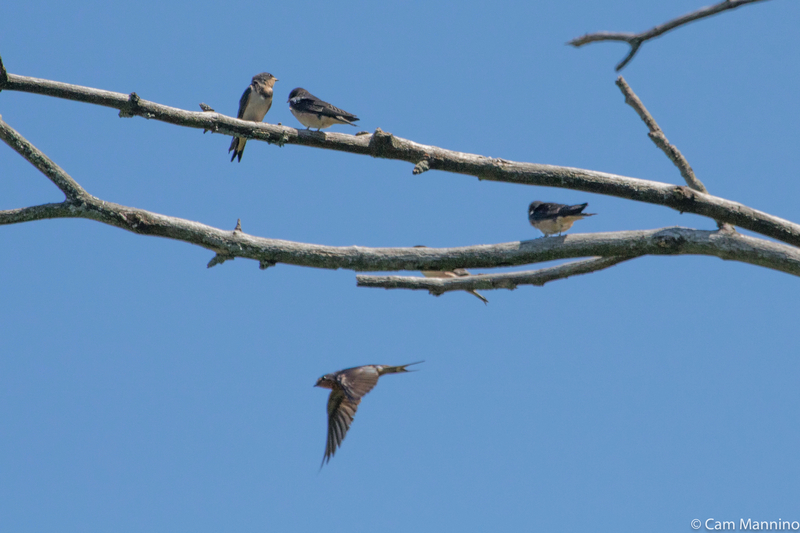 Adult Barn Swallows sport russet throats and loooong, deeply forked tails. These were obviously fledglings. 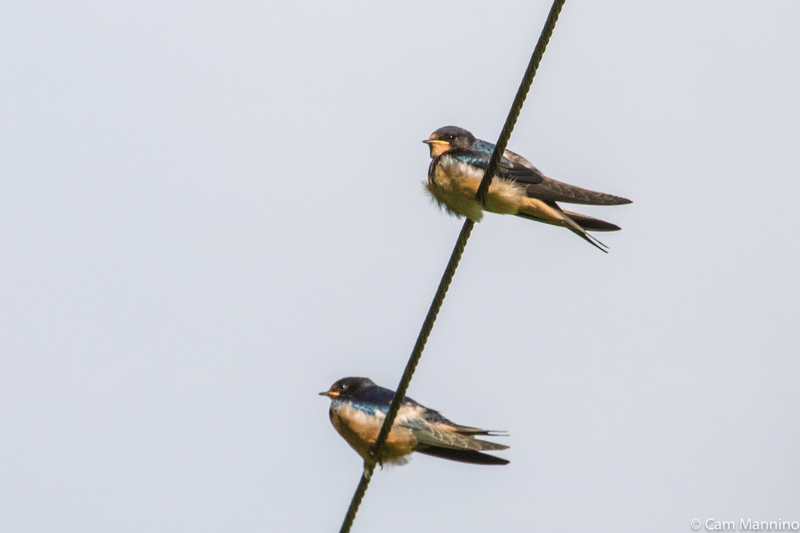 Two Barn Swallow fledglings sat quietly on a wire, occasionally testing their very long wings. These youngsters were still slightly downy, shorter-tailed than adults, and only partially iridescent blue-black on the back. They sat remarkably still on the wire and periodically tried extending their wings. 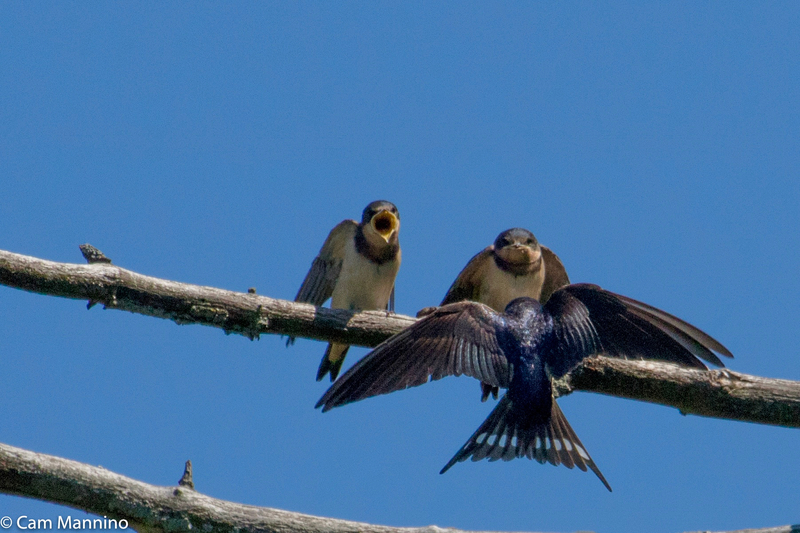 The fledglings below seemed to tip slightly back and forth as if trying to find its balance with those snazzy new wings. And the light color on the side of its bill is also typical of a juvenile Barn Swallow. 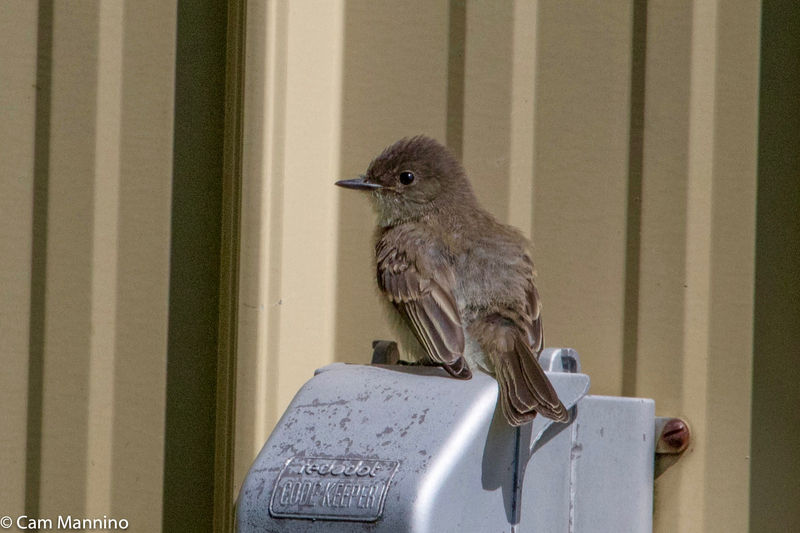 What appeared to be a well-behaved, quiet young Eastern Phoebe (Sayornis phoebe) – on the right below – traveled about on the edge of the north prairie as its parent (left) slipped down into the grass periodically to forage like grown-up flycatchers. 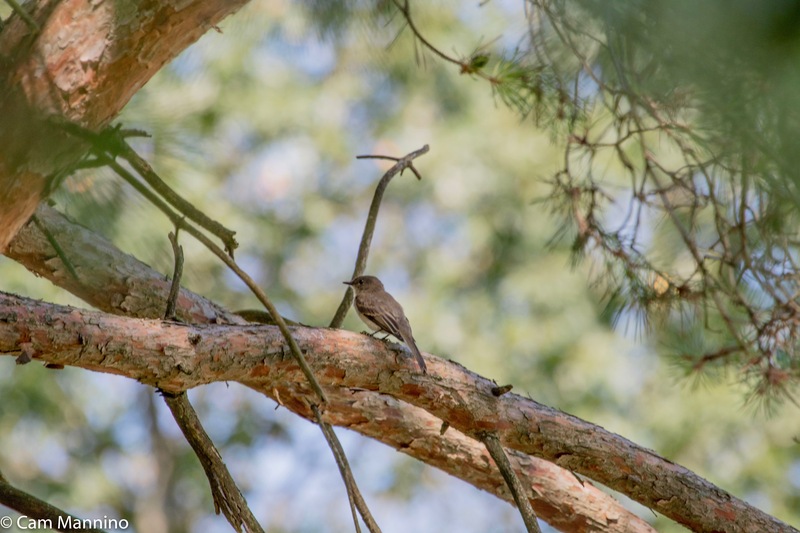 From a distance in bright morning light, it was hard to see if the presumed youngster (right) had a slightly more yellow lower belly than the adult. 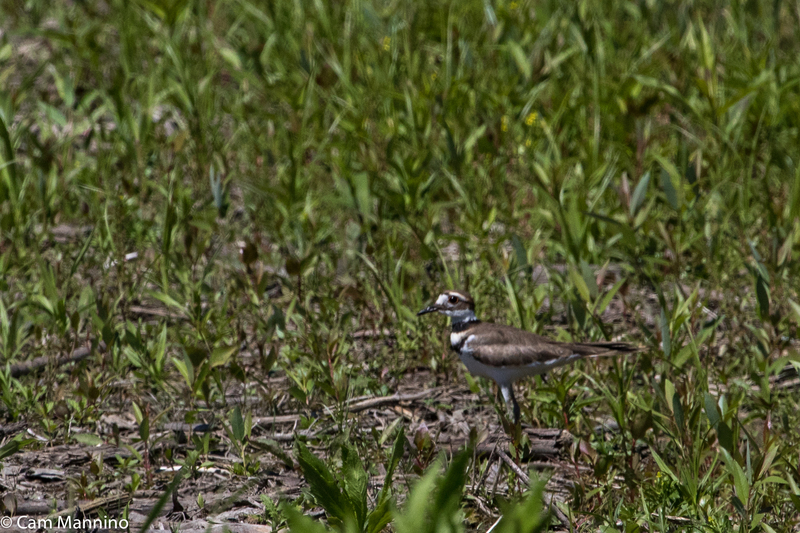 The smaller bird looked a bit misproportioned, though, like a lot of fledglings do and also had a more “smudgy” juvenile breast as described by Cornell lab. So my conclusion is I was looking at an adult and its offspring. 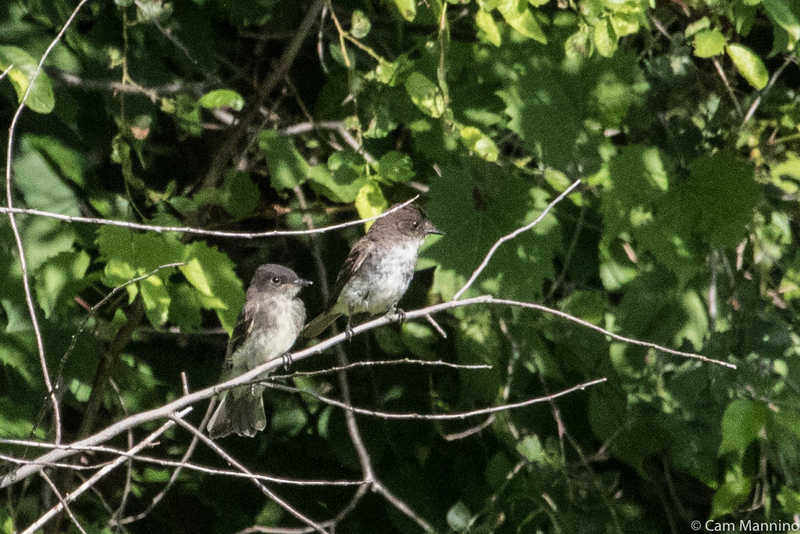 What appeared to be an adult Eastern Phoebe (left) with its more smudgy-breasted youngster on the right. Ben spotted a bird with a long sweeping tail in a snag near the prairie and quickly identified it. 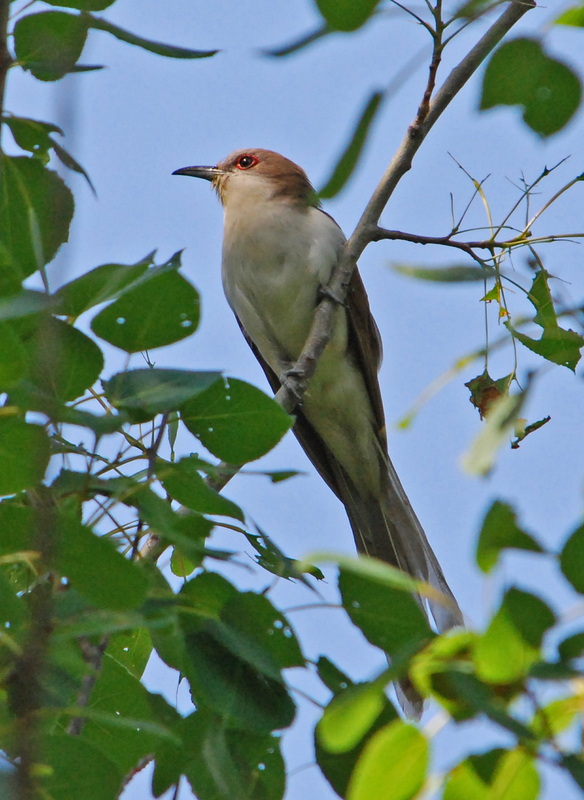 According to Cornell Lab, the Black-billed Cuckoo (Coccyzus erythropthalmus) is “common but secretive” and “heard far more often than seen.” Evidently, it eats lots of spiny caterpillars and has adapted to that spiky diet by shedding its stomach lining periodically to get rid of the spines. Yikes! 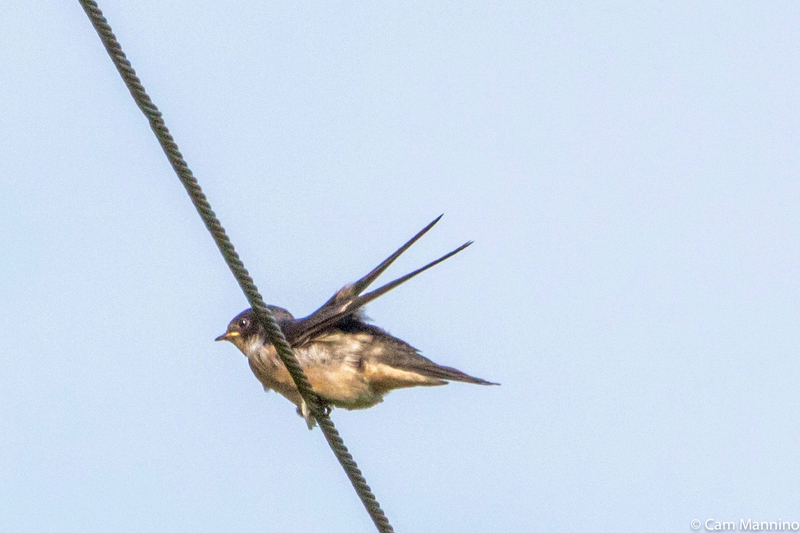 I caught sight of the cuckoo flying with its very long tail trailing behind, but never got a shot. 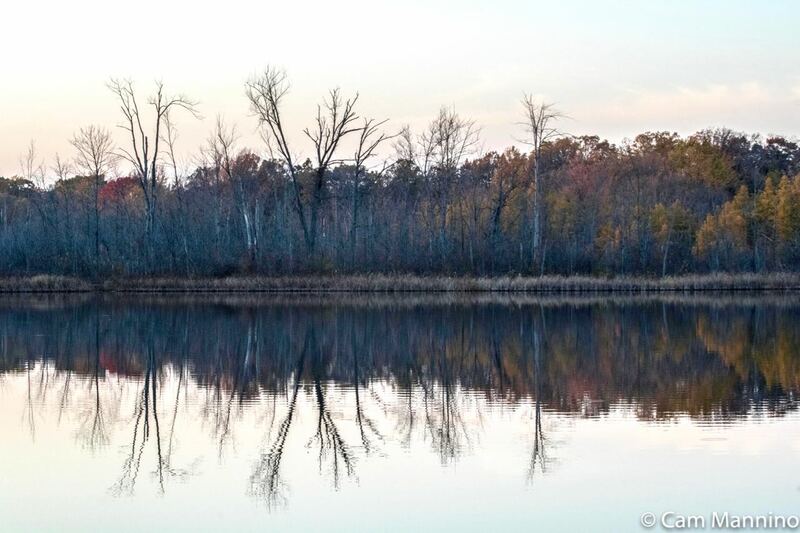 So here’s a beautiful photo from a gifted photographer, Jerry Oldenettel, on inaturalist.org. 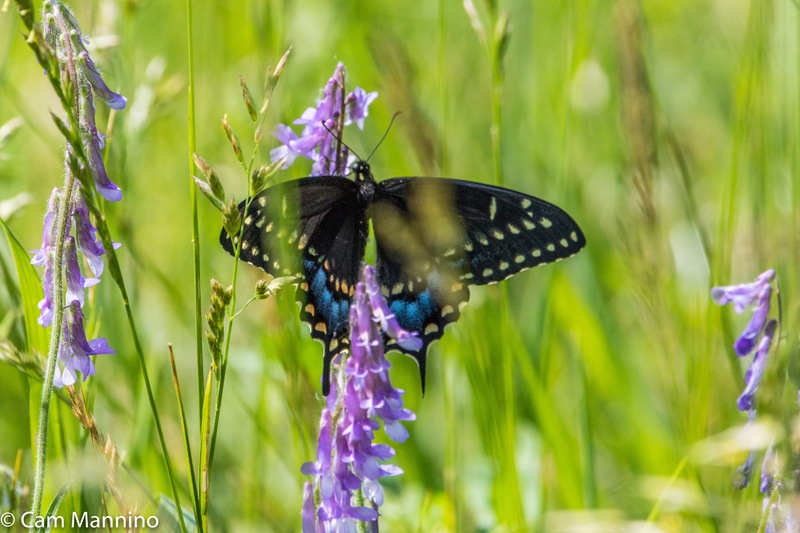 A female Black Swallowtail shows her distinguishing big band of blue spots as she sips from Hairy Vetch, a non-native vine. 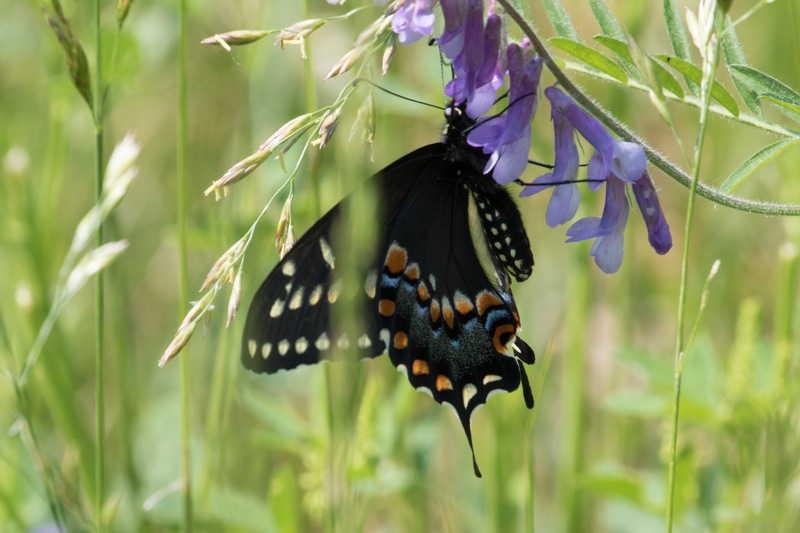 A female Black Swallowtail butterfly (Papilio polyxenes) probed the funnel-shaped blossoms of Hairy Vetch (Vicia villosa), a non-native vining plant. The large blue spots at the bottom of the butterfly’s wing tell us she is a female and the two rows of yellow spots indicate that she’s not the black morph of the Eastern Tiger Swallowtail (Papilio glaucus), which is very similar. 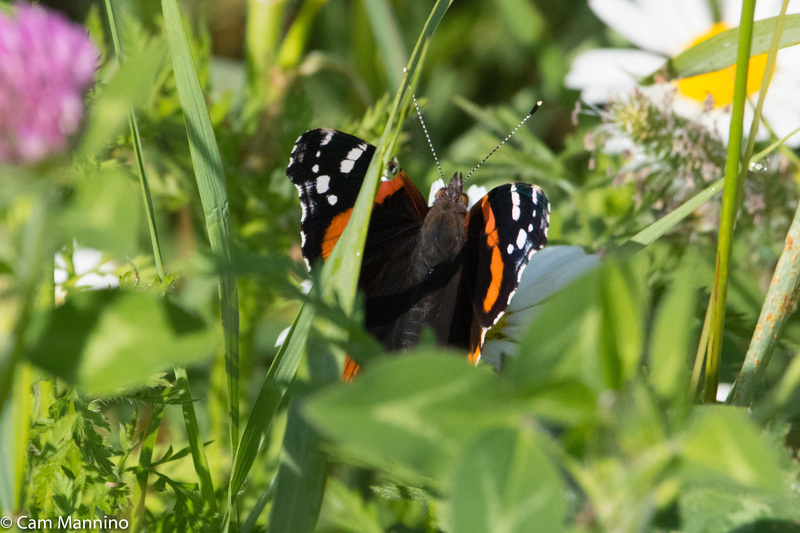 According to Wikipedia, the orange spots on the underside of her wings protect her while she’s laying eggs, because they mimic the Pipevine/Blue Swallowtail (Battus philenor) which is toxic to birds. The Black Swallowtail is not, but birds will be wary. The female Black Swallowtail’s orange spots on her hindwings mimic the Blue Swallowtail, which is toxic to many birds. 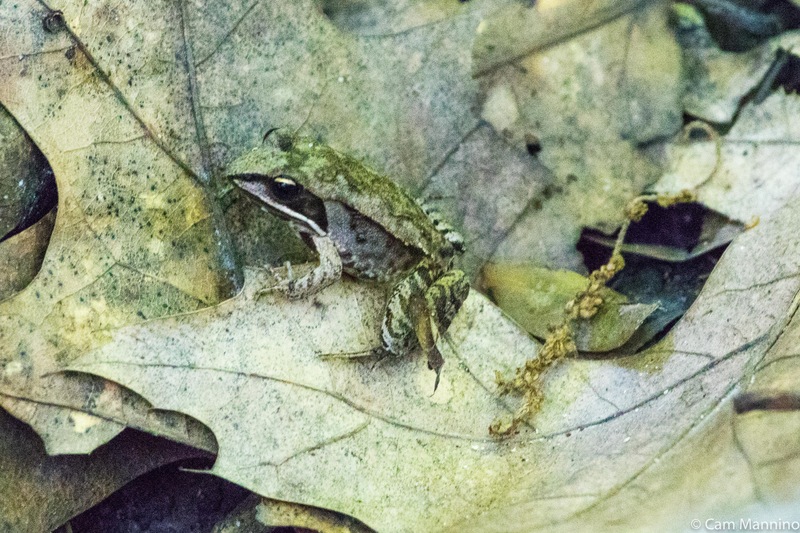 Mimicry can provide protection. Red Admirals (Vanessa atalanta) showed up on both sides of the park one morning. 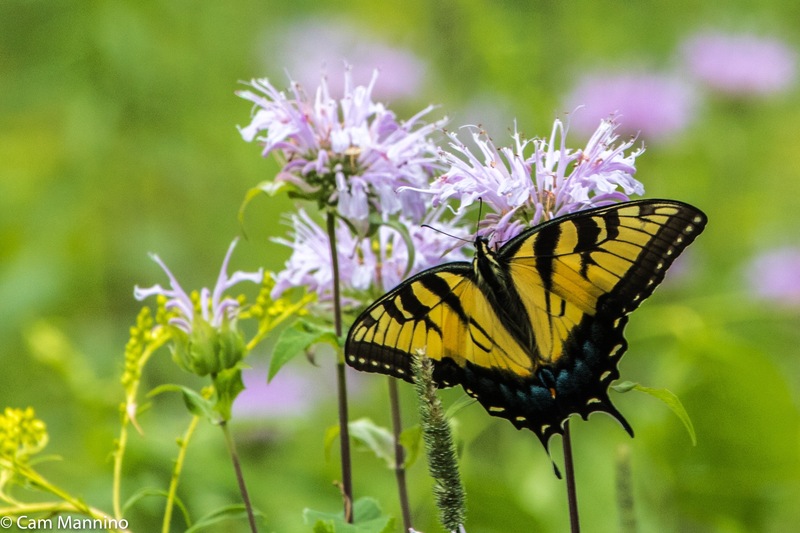 This butterfly migrates from the south rather than overwintering here. Look at those cool striped antennae with yellowish-white tips! The Red Admiral butterfly migrates from the south each spring. 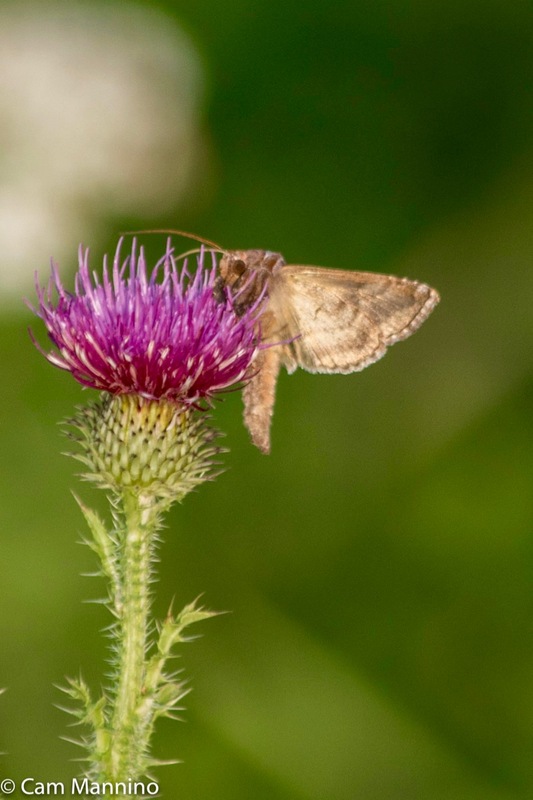 According to butterfliesandmoths.org, the Silver-spotted Skipper (Epargyreus clarus) rarely frequents white flowers and almost never yellow ones. But the males do sit on tall flowers or grasses to attract females, so perhaps this handsome skipper was trying to snag a mate! 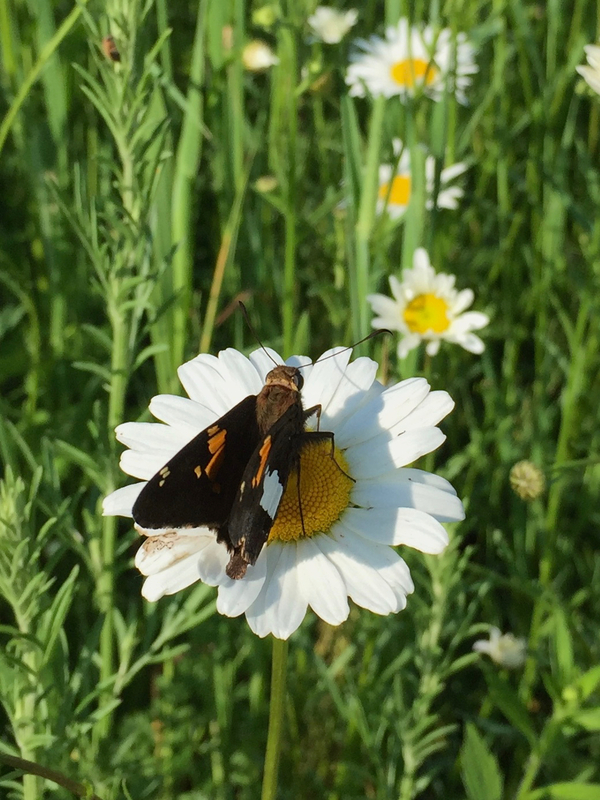 The Silver-spotted Skipper prefers more colorful flowers but may have been posing on this Daisy to attract a female. A Northern Pearly-Eye Butterfly that rested on the path one morning overwintered as a caterpillar. Like the early season butterflies (e.g. the Mourning Cloak), it feeds on sap from willows, poplars and birches or sometimes the fluids found in carrion or dung. Nature makes use of everything, doesn’t it? 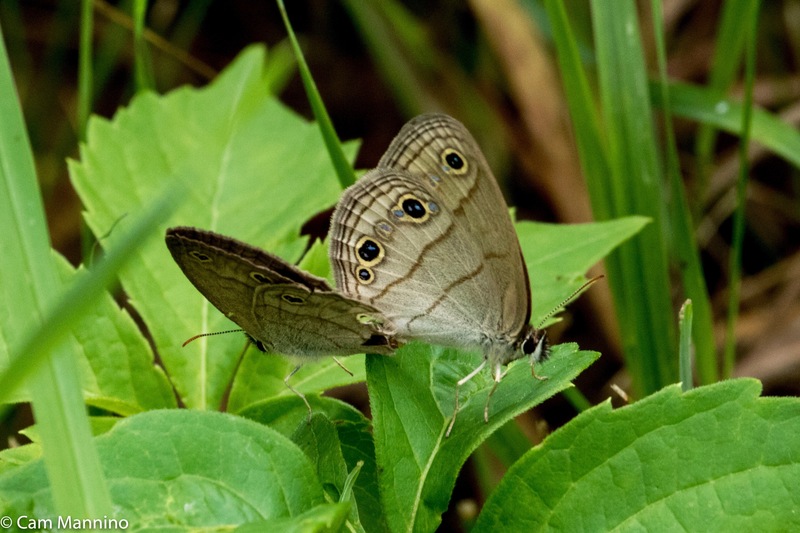 The Northern Pearly-eye butterfly feeds on sap and other fluids, but not on flower nectar. 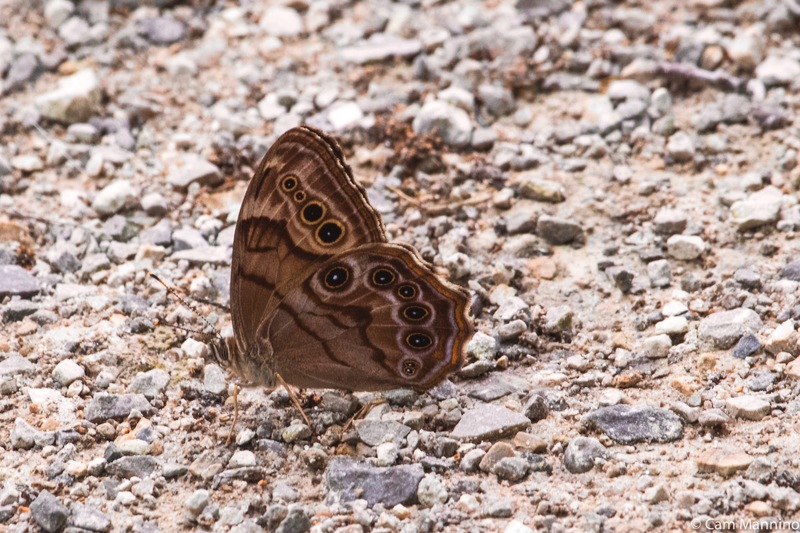 A pair of mating Little Wood Satyr (Megisto cymela) butterflies flew from the path to a nearby leaf still attached to one another as I approached. This month at Draper, Ben identified for me two beautiful native flowers I’d never seen before. 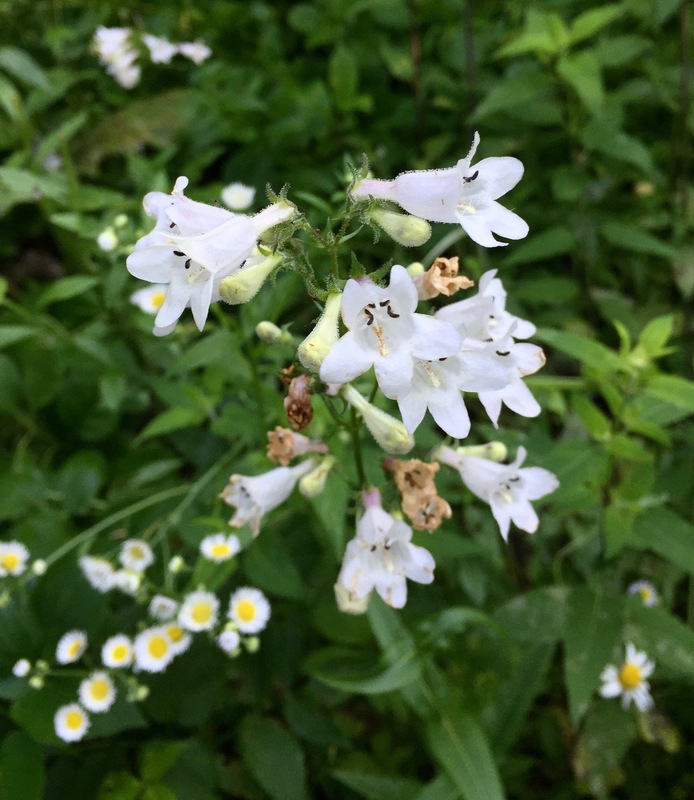 Near the lake, we spotted the fuzzy blooms of another “Beard-tongued” plant, in the same genus as the Hairy Beard-tongue (Penstemon hirsutus) featured in our Photo of the Week two weeks ago. This one is called Foxglove Beard-tongue (Penstemon digitalis). 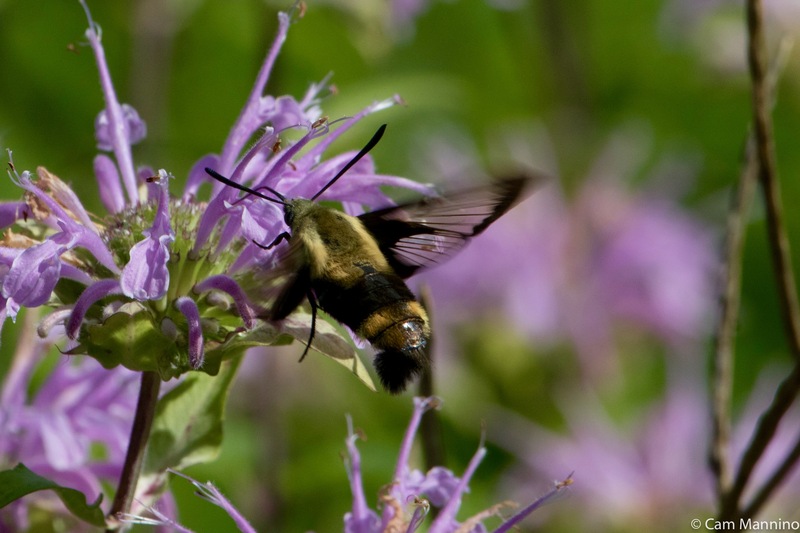 Some blossoms have little lavender stripes inside to lead insects to the nectar, helping to spread their pollen. The other native plant was a rose growing right next to the floating dock called the Swamp Rose (Rosa palustris). On one of the blooms, I spotted a tiny Katydid (family Tettigoniidae). Check out those long antennae! A Swamp Rose blooming at the edge of the floating dock. I always like to know the names of flowers whether native or not. It keeps me more aware of the detail in the landscape. 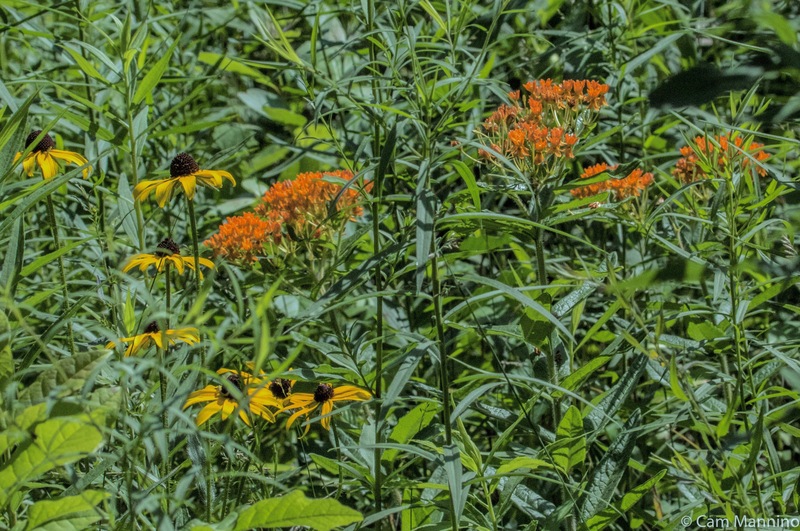 So here are three kinds – native wildflowers, non-natives that are not always invasive, and an invasive plant that does harm to other plants by shading or crowding them out and multiplying aggressively. 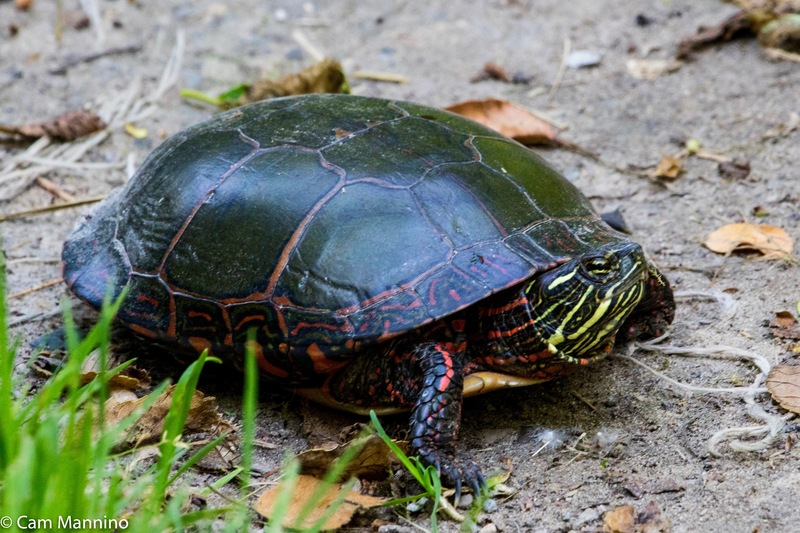 Often in early summer, I see Painted Turtles (Chrysemys picta) walking along the same trails I’m taking. They’re looking for soft, sandy soil where they can bury their eggs. Some places are definitely more hospitable for this purpose than others. This Painted Turtle came trundling along a path near Draper Lake, perhaps returning from an attempt to safely bury her eggs. A Painted Turtle perhaps returning from a soft spot in the soil where she buried her eggs. But out on the prairie on the eastern side of the park, evidence abounds that lots of animals love to find and eat turtle eggs. On one outing with the birding group, we spotted several turtle nest dug up with the leathery white egg shells laying outside. 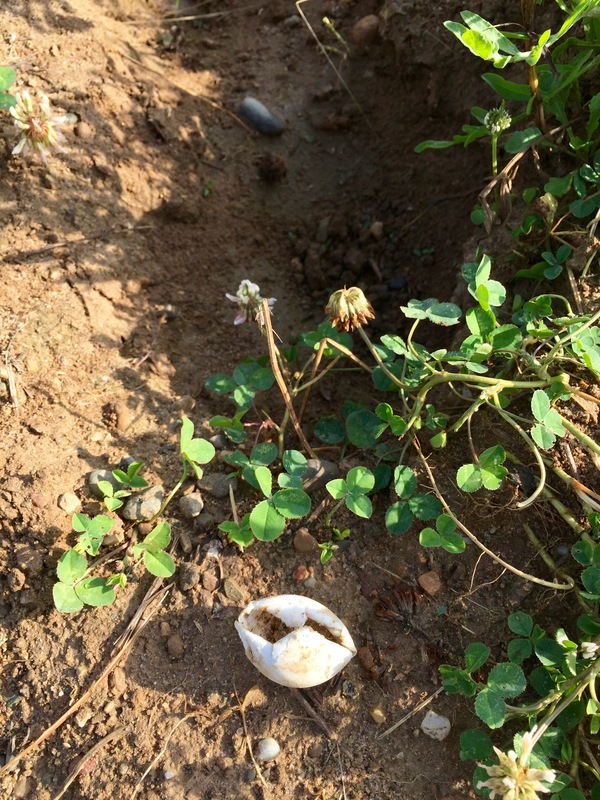 Some animal has dug up a turtle nest and eaten the eggs leaving the rubbery shell. Among the creatures that enjoy turtle eggs are raccoons, foxes, coyotes, skunks, and birds like herons, gulls and crows. As an (chicken) egg eater myself, I can’t complain. Luckily, Painted Turtles are our most abundant turtle species, so I assume nature is just taking its course as usual. 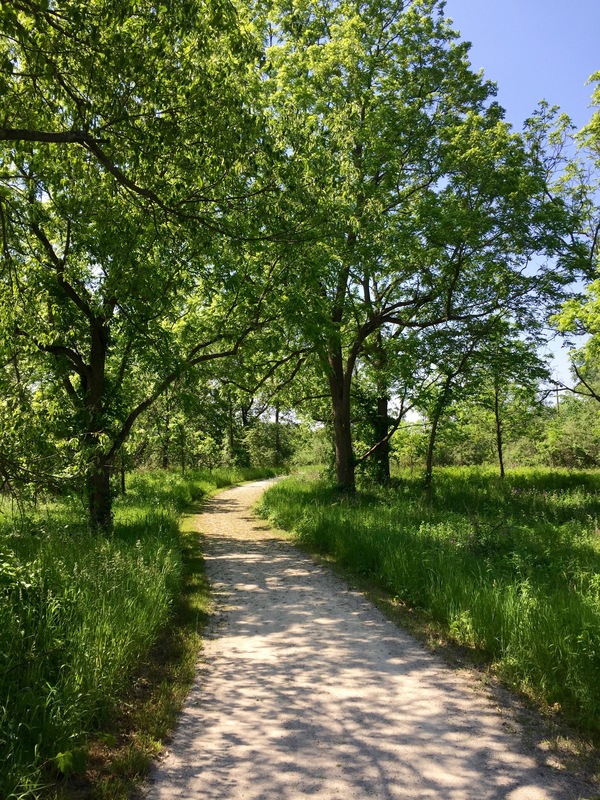 Dappled light on a trail on the western side of Draper Twin Lake Park. It’s always iffy to anthropomorphize and assume that the behavior of other animals is similar to our own. We can’t, of course, know for sure what motivates a particular animal’s behavior. After all, we don’t understand our own motivations sometimes! But science is increasingly exploring the social and emotional lives of all sorts of creatures and discovering that many teach and learn in much the same way we humans do. And of course, animals have knowledge, skills, and memory that is superior to our own – for example chickadees remembering thousands of places they have stashed seeds or nuts. So when young fledglings beg to be fed or practice short flights in much the same way that little children pester us for food or learn to walk, it’s probably normal to feel an intuitive understanding of what might be going on. If we smile in recognition of our kinship with all creatures, maybe that will help us be more careful stewards of the natural world in which we’re embedded. And that has to be a good thing, right? My last blog on Draper Twin Lake Park was in April. 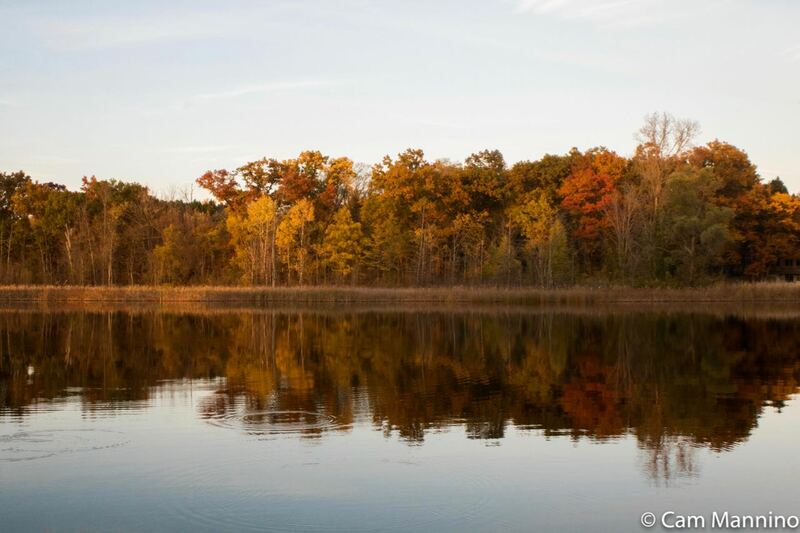 So I thought it was high time to return there to share how its lake, wetlands and prairie transform in autumn. I began the first week in November, just before the first hard frost, and ended in the cold, gray days before Thanksgiving. Autumn brings such dramatic changes. Brilliant leaves, hardy fall flowers, migrating birds and insects give way to winter birds and the quiet, brown-and-gray austerity of November. 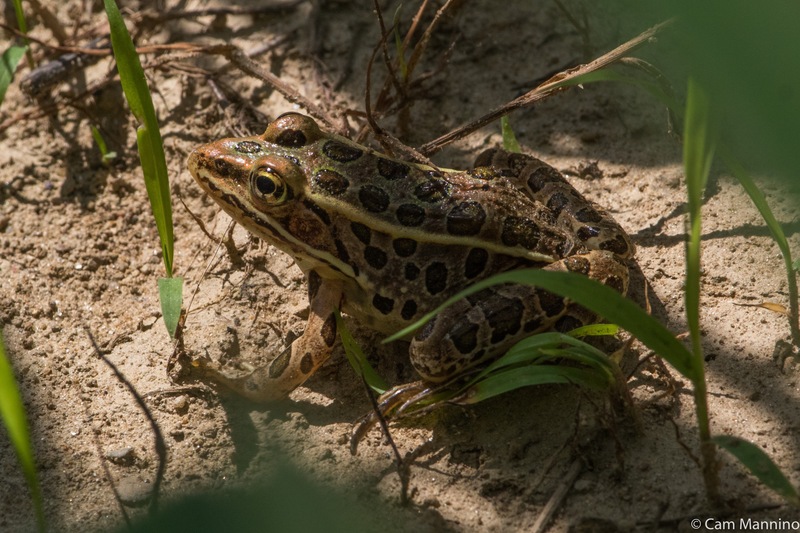 In the April blog, I explained, with a map, the three sections of Draper – the western lake section, the central large marsh that separates the two hiking areas, and the eastern marsh/prairie section. You can refresh you memory at this link, if you like. 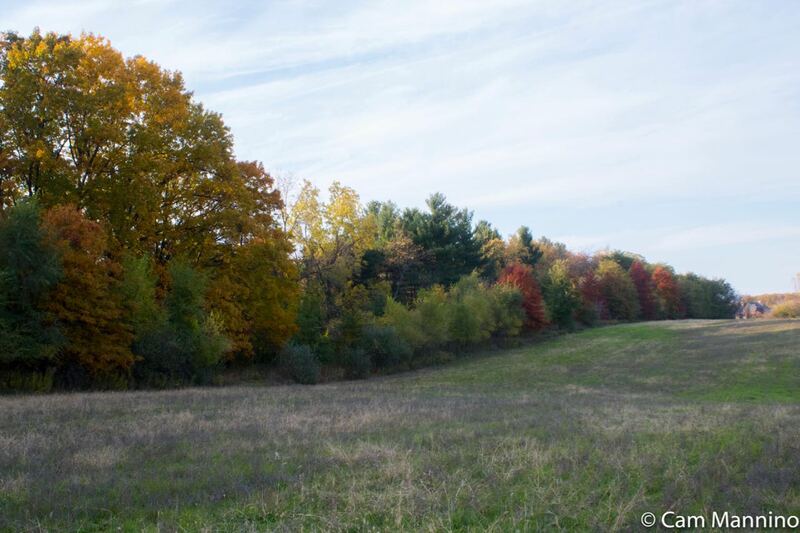 So join me for a series of virtual hikes in this unusual tripartite park to watch nature hunkering down for winter. As you can see above, the lake was beautifully calm one early November afternoon. An angler at the fishing dock that day shared his excitement from the previous day when he’d caught a 25 inch Largemouth Bass (Micropterus salmoides) there. In the photo above, you can see the water circles made by something surfacing and by the angler’s line in the water, but luck wasn’t with him that afternoon. 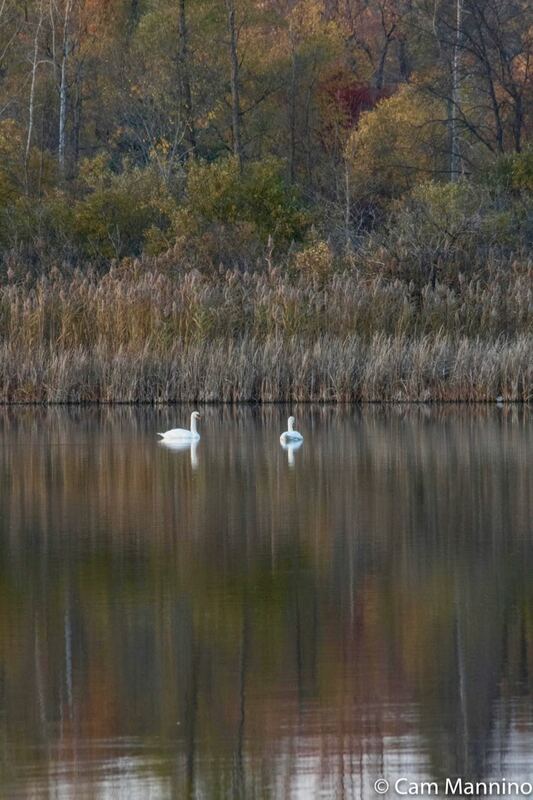 In the distance, a pair of Mute Swans (Cygnus olor) floated peacefully along the far shore, apparently unconcerned about the angler and his line. The grace of these non-native birds is irresistible, but how I wish I could see native Trumpeter Swans (Cygnus buccinator) in our township parks. In childhood, I saw one on a pond near Orion Road, but they aren’t common. The more aggressive Mute Swans have affected their numbers by commanding the prime nesting sites. 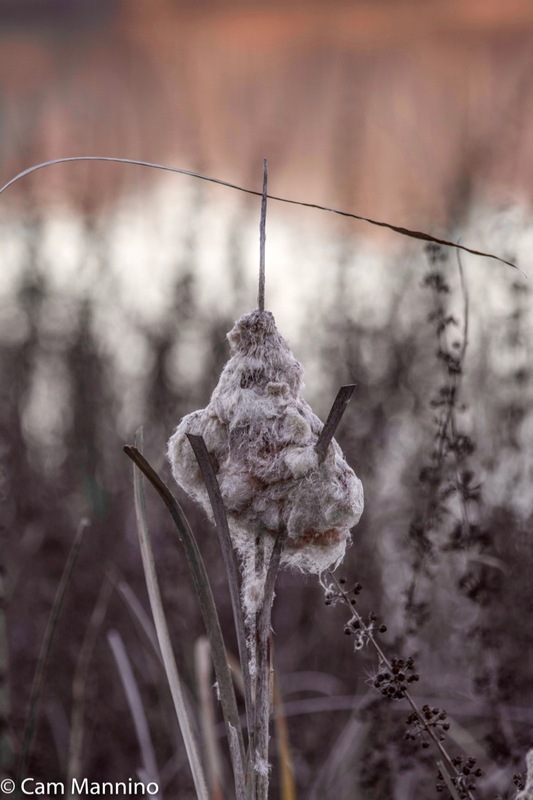 And native trumpeter swans were almost wiped out in the 19th century by two forces – the fashion industry that coveted their feathers and the hunting of muskrats and beavers whose lodges made dry nesting places for native swans then as they do for Canada Geese today. In the water alongside the dock, a few fruits of the Swamp Rose (Rosa palustris) remained on their dark stalks. I wish I’d experienced this native plant’s pink blossoms and sweet fragrance when it was in bloom. 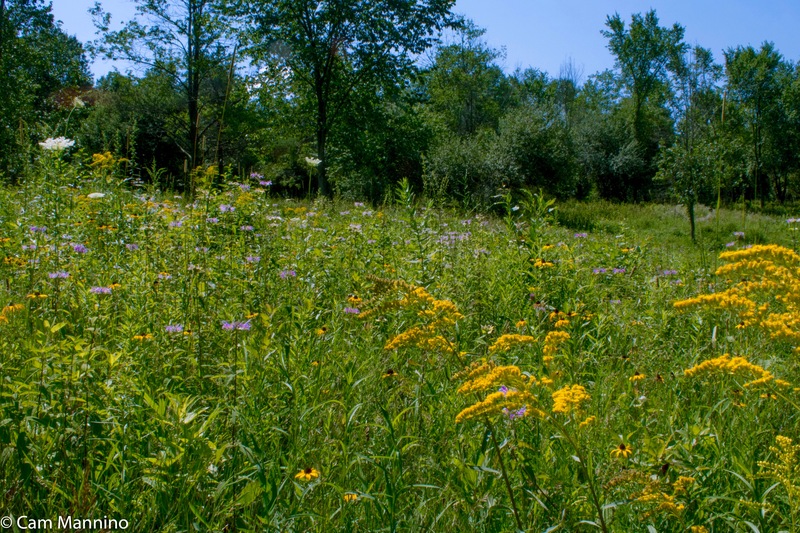 (Here’s an Illinois Wildflowers link to a photo.) 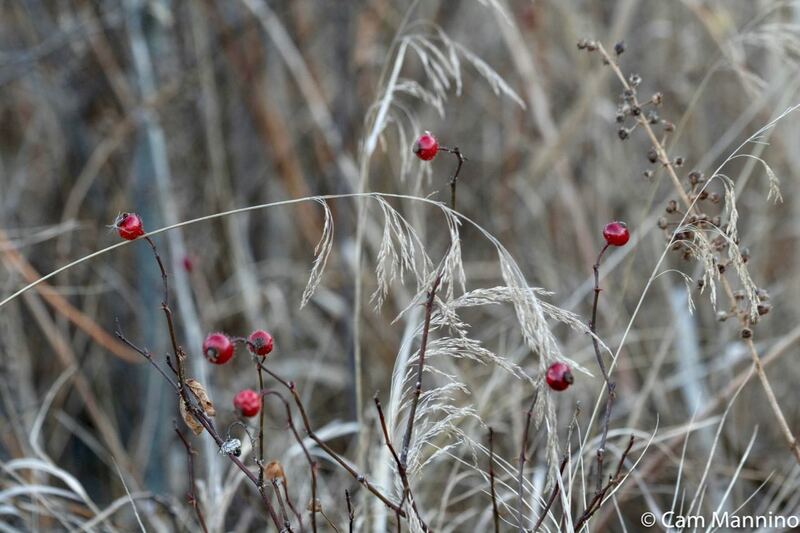 Aren’t the bright crimson spots of the rose hips pretty against the silvery dried grasses in the marsh? Some yellow and lavender leaves crowded the railing at the end of the dock near the shore. 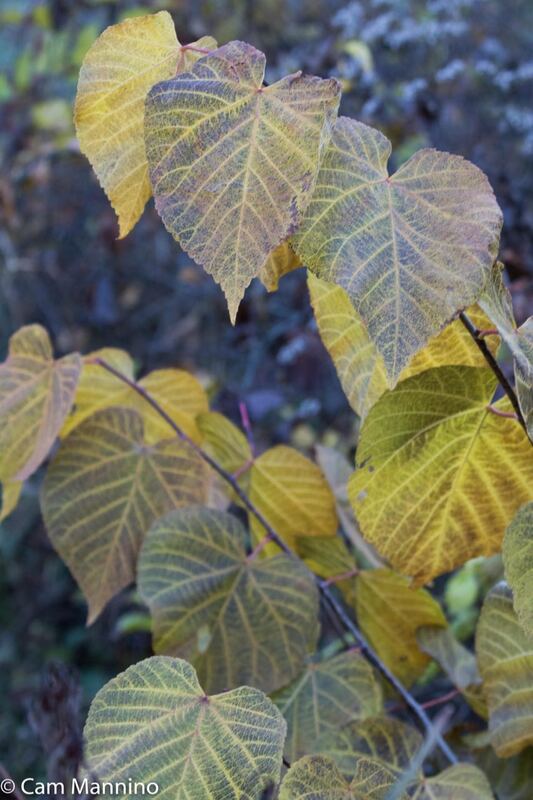 Ben VanderWeide, our Natural Areas Stewardship Manager, identified them as possibly the stems of a small Basswood tree. I wonder if the deer and rabbits that like to eat Basswood saplings during the winter will let this one grow. Basswood is fine-grained and soft so it’s often been used by whittlers to carve small objects like children’s toys. 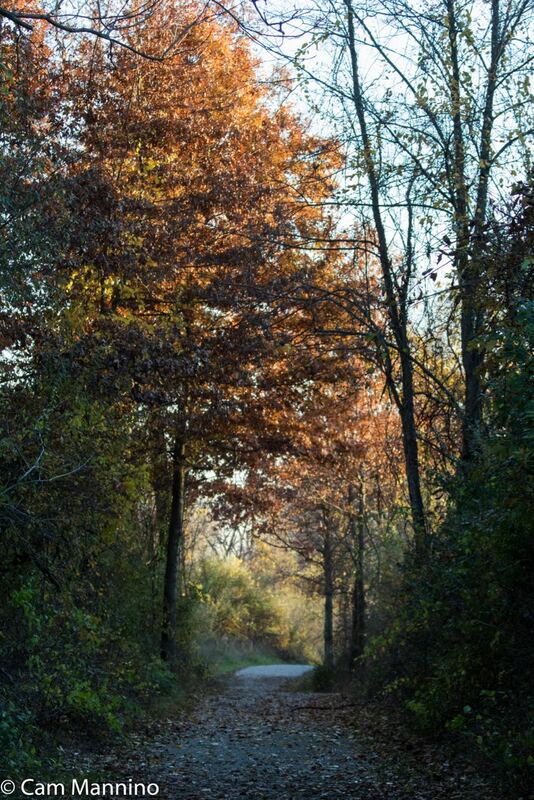 When I headed back to the western parking lot in early November, many of the autumn leaves along the trail were still russet and golden. Trees and bushes along the trail back to the parking lot were still leafed in russet and yellow. 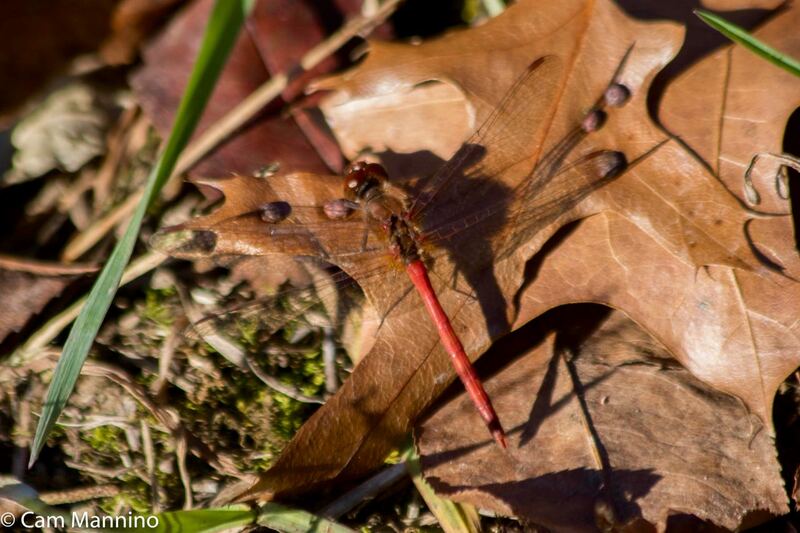 One of the last insects of autumn, a Yellow-legged Meadowhawk/Autumn dragonfly, flitted down the trail, keeping me company as I headed back from the lake. Its clear wings with their brush of orange at the base, as well as its orange-red body provide good camouflage once it lands on a fallen leaf. 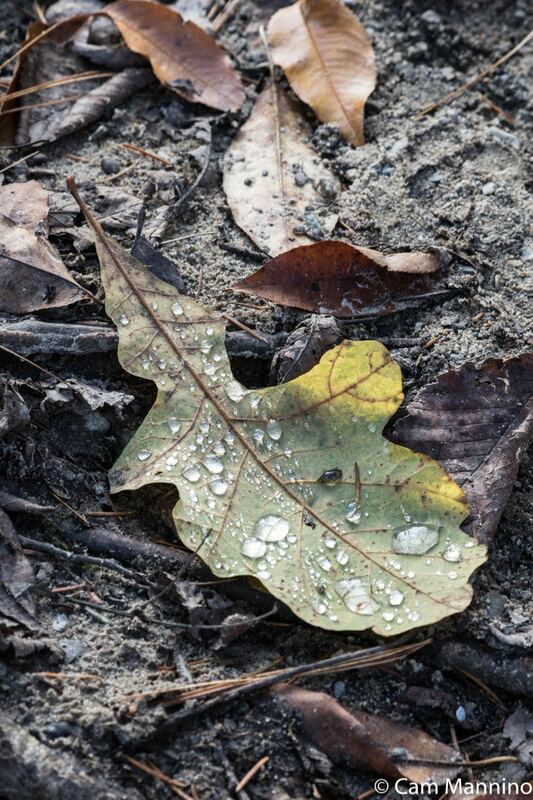 After an afternoon shower, I saw a Bur Oak leaf (Quercus macrocarpa) along the trail beaded in silver raindrops. The leaf of a Bur Oak beaded after a rain. On the way out of the parking lot, a cheerful “family” of Shaggy Mane mushrooms (Coprinus comatus) stood at attention at the edge of the parking lot. The overnight appearance of mushrooms on autumn days almost makes up for the thinning out of wildflowers. A week or so later, I returned to the lake near sunset and the view had changed quite dramatically but was still very lovely. The Whorled/Swamp Loosestrife that surrounds the fishing dock had gone to seed. 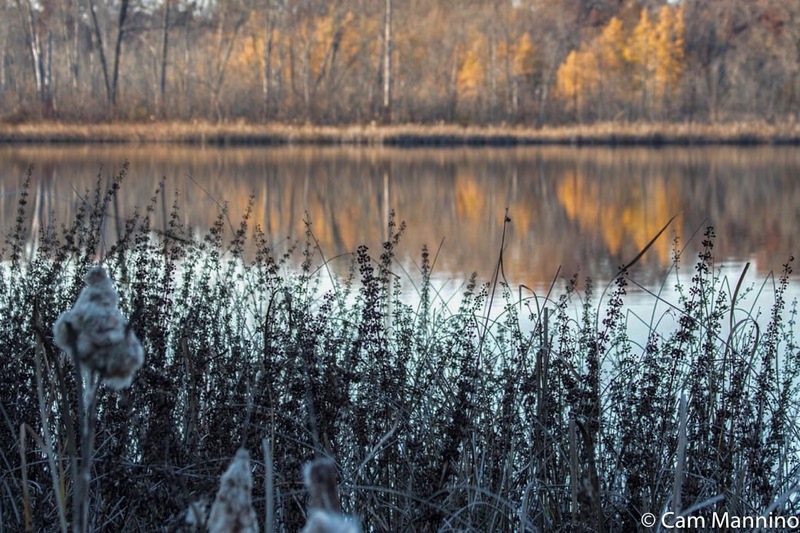 Ben identified this native wildflower for me and called it “a very nice plant to see in wetlands and around the margins of lakes.” It had purple blossoms in the summer and now made a graceful silhouettes against the autumn reflections in the lake. The pointed male section at the top of Cat-tails (genus Typha) had fertilized the female “brown-suede” section below earlier in the summer. Now huge plumes shed their seeds at the edge of the dock in the rosy light of an autumn sunset. By late November, the pair of swans had probably departed for points south and one breezy afternoon, a trio of Canada Geese (Branta canadensis) took their place on Draper Lake. They drifted with the wind, dipping their long necks below the surface periodically to feed on submerged vegetation. 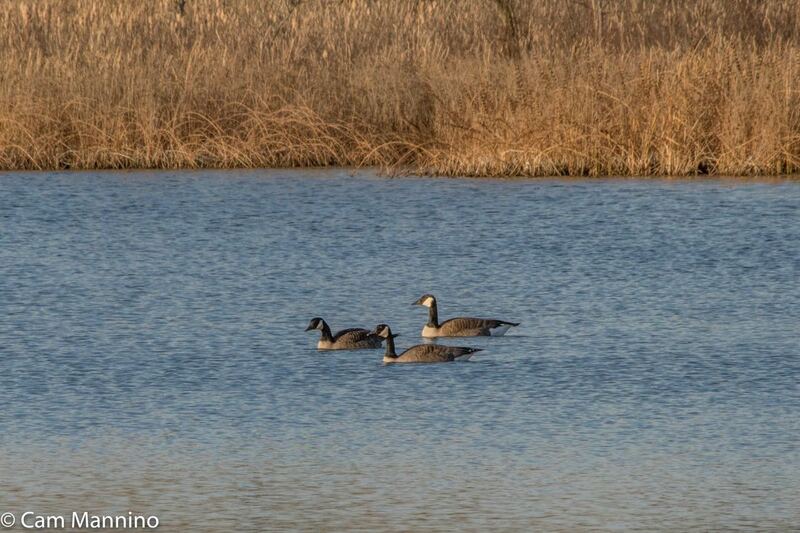 In late November, three Canada Geese drifted effortlessly down the pond, carried by the wind. 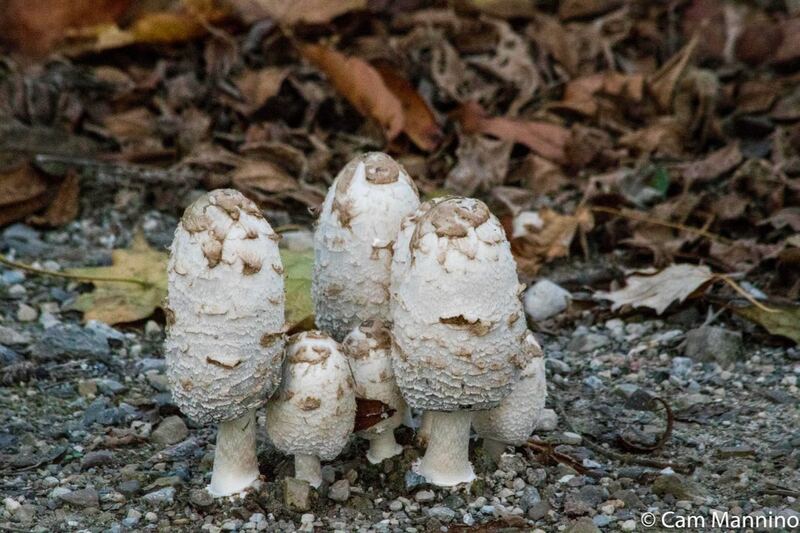 The Shaggy Mane mushroom family had disappeared, as mushrooms can do so suddenly and completely. But as I got back to the parking lot on my later visit, some orange mushrooms glowed in the distance on a dead branch. 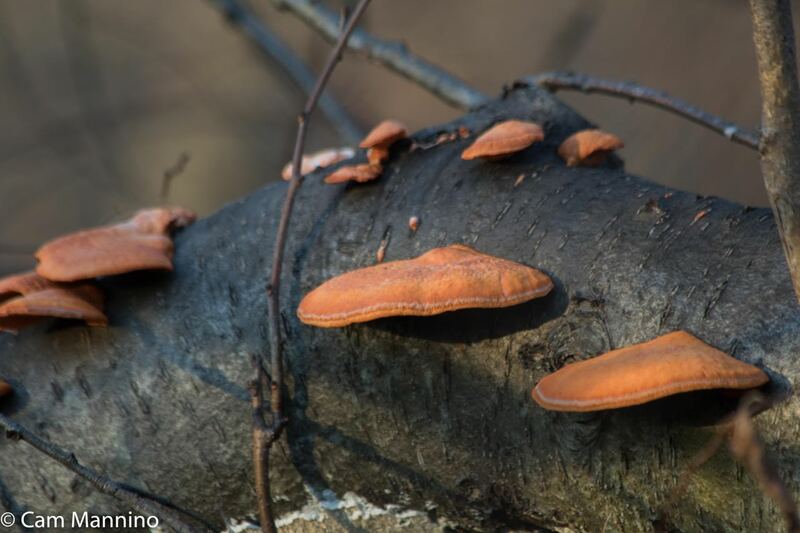 My best guess is that they are toxic Jack O’Lantern mushrooms (Omphalotus illudens) which cluster on dead wood in the fall. But I’m no mushroom expert so feel free to correct me! Heading east from the lake section of the park, past the big marsh on the left, you reach a driveway near the crest of hill where a gray building and a small parking lot indicate you’ve reached the the eastern section of Draper Twin Lake Park. 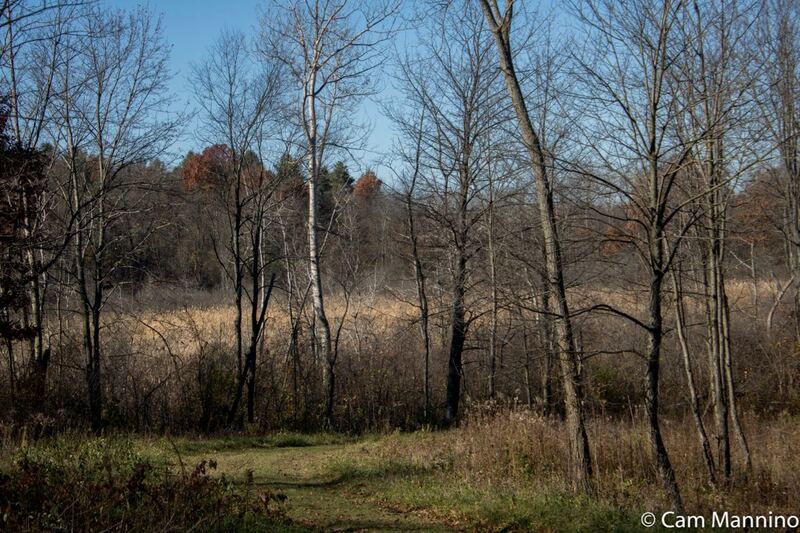 As you head off down the trail on the left, in the distance you can see the big central marsh through the trees. In early November, a few fall wildflowers were still in bloom along this part of the trail. 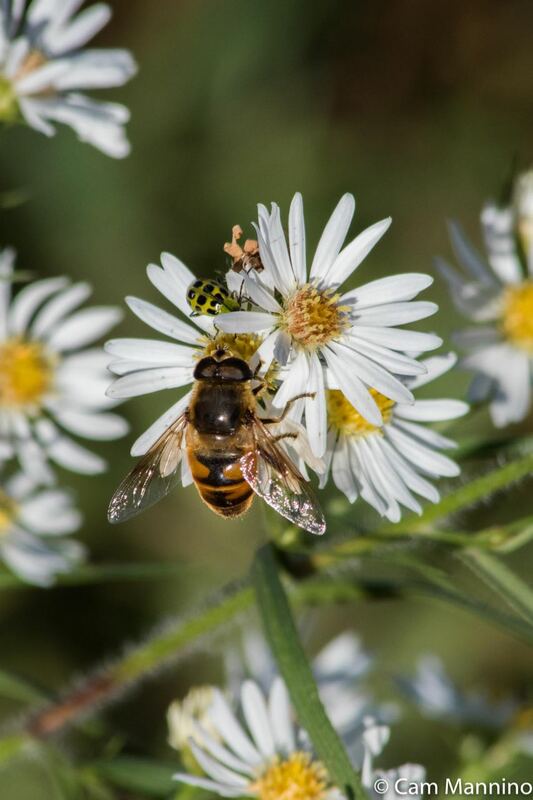 As I set off, I thought I saw a bee probing a blossom of a fall aster (genus Symphotrichum) but on closer inspection, it was one of many Hoverflies (family Syrphidae) that mimic the bee’s appearance, perhaps to ward off predators. Bees were noticeably absent. Presumably non-native European Honeybees (Apis mellifera) had already retreated to their hives inside nearby trees and native Bumblebee queens (genus Bombus) were settling into their individual underground burrows. Crawling into that blossom above is another insect that was new to me. 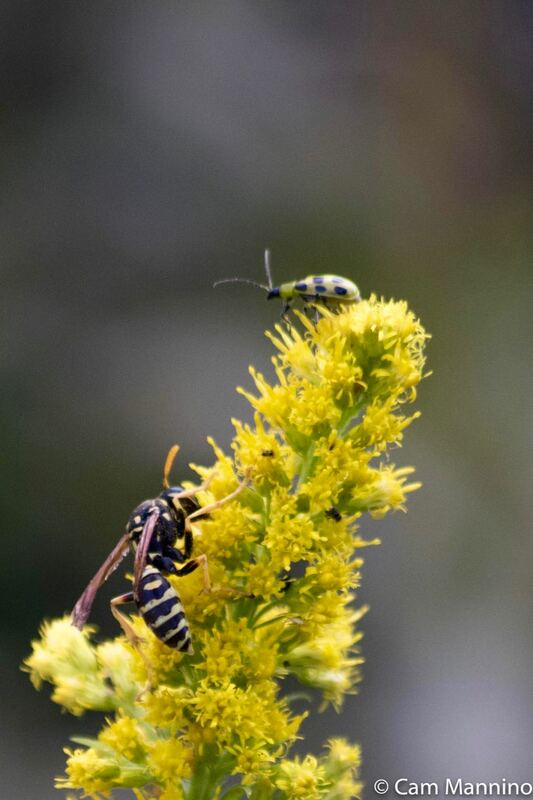 I got a clearer shot of the Spotted Cucumber Beetle (Diabrotica undecimpunctata) as I watched the Eastern Yellow Jacket (Vespula maculifrons) below foraging for nectar on a Showy Goldenrod (Solidago speciosa). The beetle’s lime green thorax, spotted abdomen and striped antennae make it look like a cartoon insect, but it’s a major pest for farmers. These bright green beetles attack a variety of crops, including cucumbers and soybeans, and their caterpillars (or larvae) drill down to eat the roots of young plants. Here at Draper, though, this one seemed to just be searching for food quite peaceably with its neighbors, the wasp and hoverfly. As you round that first curve in the trail, there’s a “floating mat” marsh to your right. 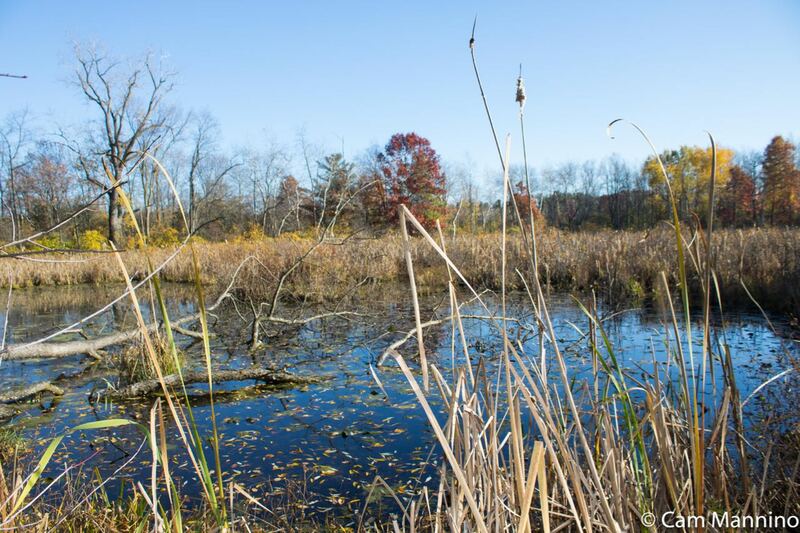 In the center of this marsh is a tightly woven tangle of plants and roots with water running beneath it – and shrubs as well as individual plants thrive on this mat. Ben’s group spotted a Swamp Sparrow (Melospiza georgiana) as well. It has longer legs than other sparrows so it can wade into water. It will actually put its whole head under the surface to fish out small invertebrates. It was on its way south, too. 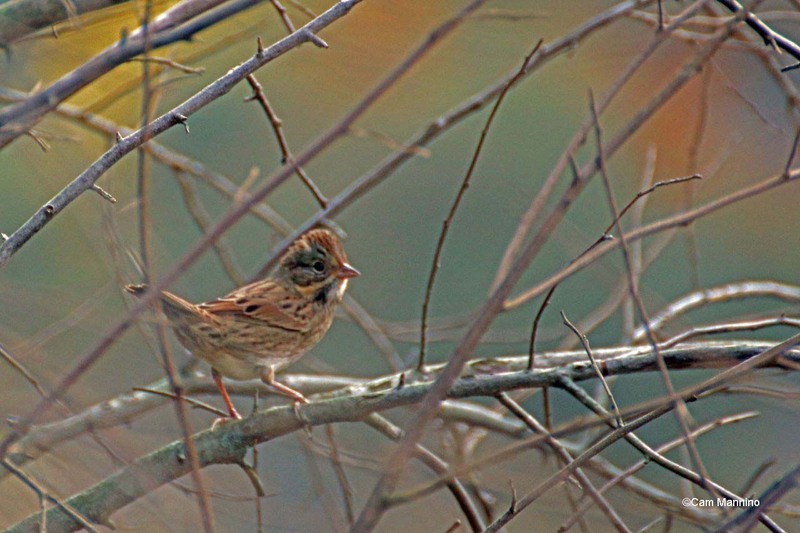 The Swamp Sparrow has longer legs than other sparrows so it can wade into the water to fish for small invertebrates. After turning the corner at the north end of this path, you’ll see the prairie that’s being restored from an old farm field. When I went in early November, the trees along the edge were in full color. (See the photo at the top of the blog.) 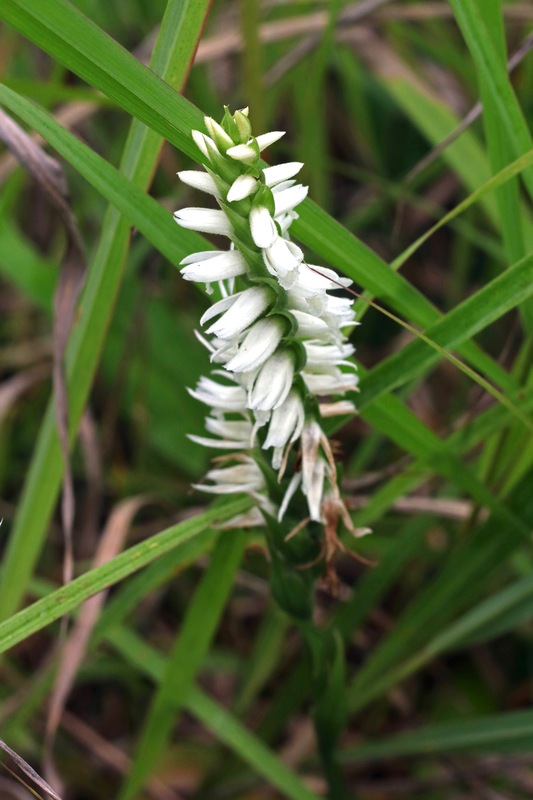 In the prairie itself, some native plants were still blooming this fall. I was surprised to see Black-eyed Susans (Rudbeckia hirta) still turning their bright faces to the autumn sun. Ben identified for me another native plant as White Vervain (Verbena articifolia) which produces tightly packed tiny white flowers in the summer. The Blue Vervain (Verbena hastata) that Ben planted on the prairie last fall will hopefully make an appearance next year. 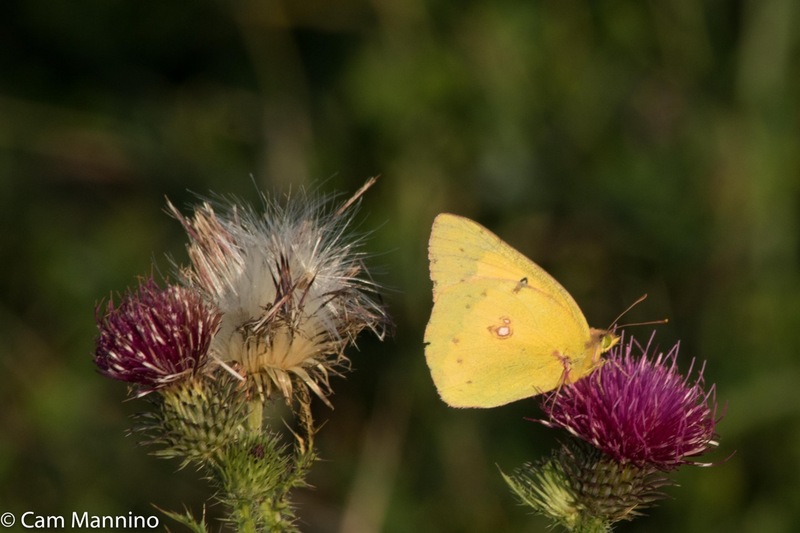 A female Clouded Sulphur butterfly (Colias philodice) danced among the dry stems on the field, finally landing on a seeding Bull Thistle (Cirsium vulgare), trying to find a last sip of nectar before the first frost. Nearby, a drab little Skipper (family Hesperiidae) that I was unable to identify had found the same plant for a last minute snack. As I rounded the curve and headed back to the parking area, I heard a commotion in an adjoining field. 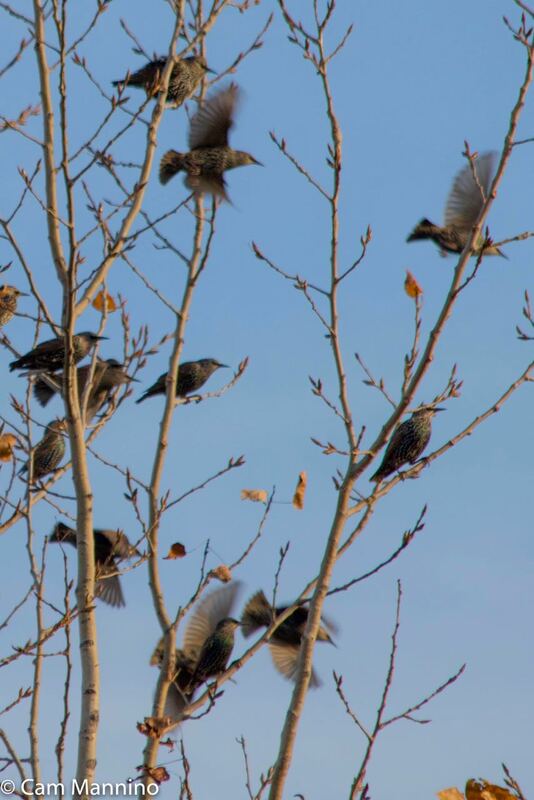 And suddenly a small tree was filled with dozens of European Starlings (Sturnus vulgaris) gathering for their migration. Such a gabble of sound and a fluttering of restless wings! By late November, most of the color had drained from the trees. Around the marsh edges, the Poplars (genus Populus) created a crisp contrast to the russet leaves nearby. 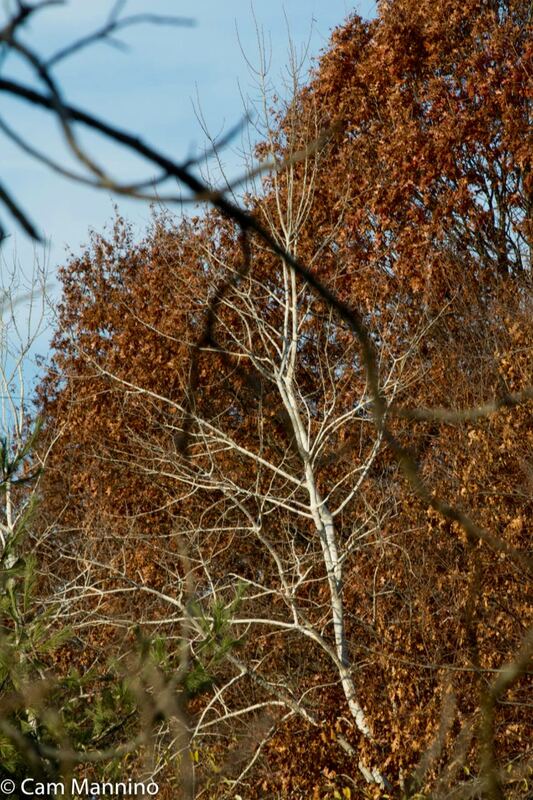 Bare poplars create a sharp contrast with the russet leaves of autumn. 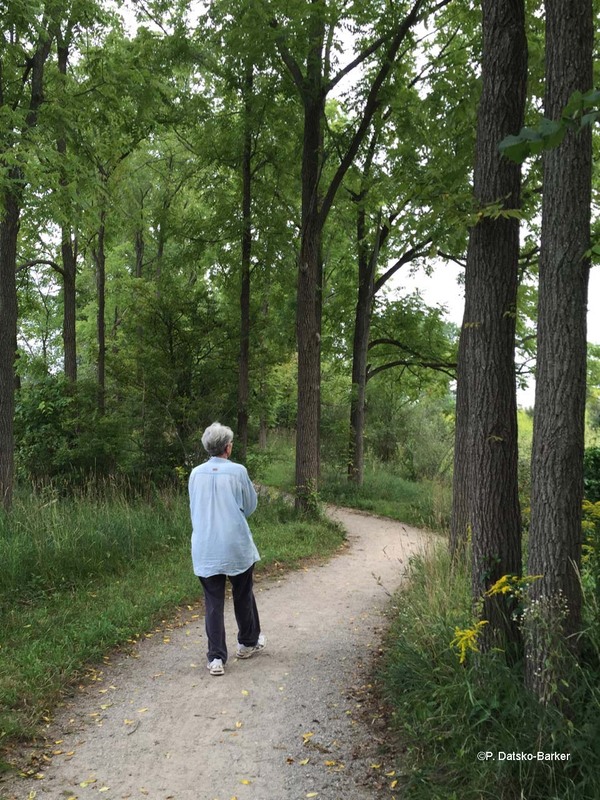 Poplars are plentiful in many of our township parks, while White Pines (Pinus strobus) are less frequent. These soft-needle, native pines were lumbered off from the late 18th through the early 20th century. 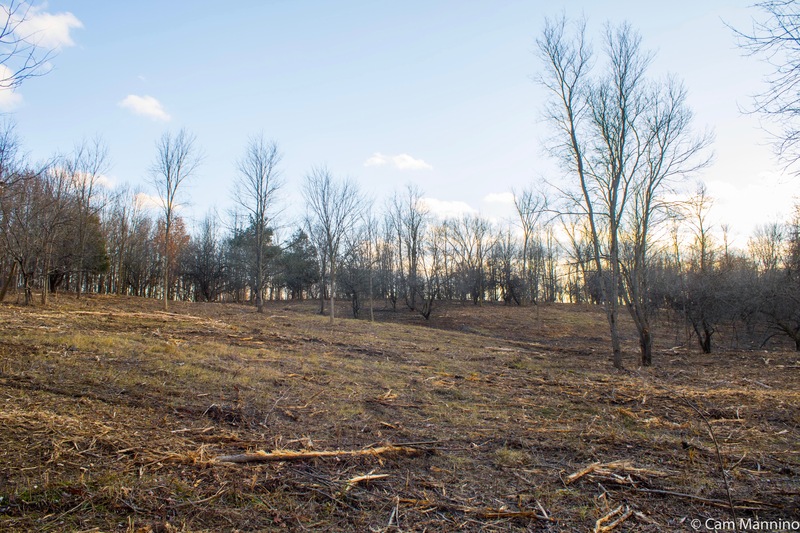 The few very large white pines that remain in our township probably reflect where they were found historically, while the smaller white pines most likely spread from planted trees often used in landscaping. 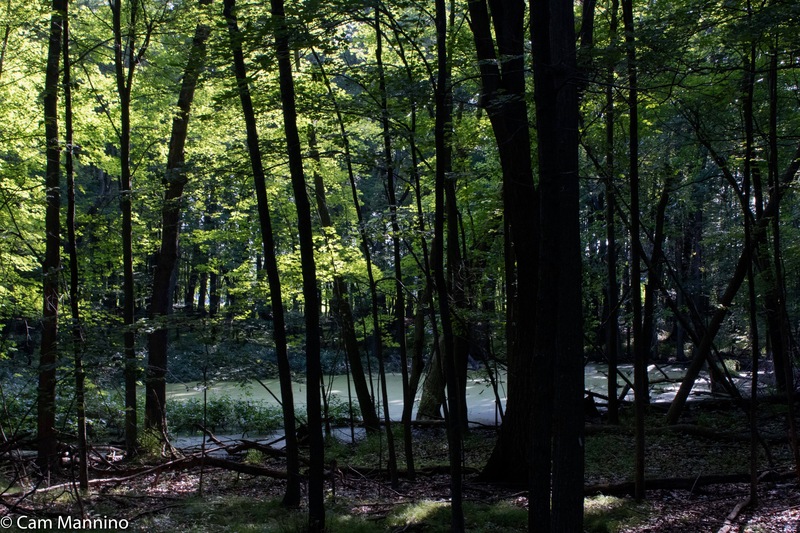 According to Wikipedia, White Pines produce new needles each spring which they shed about 18 months later in the fall, creating thick carpets on the ground beneath. 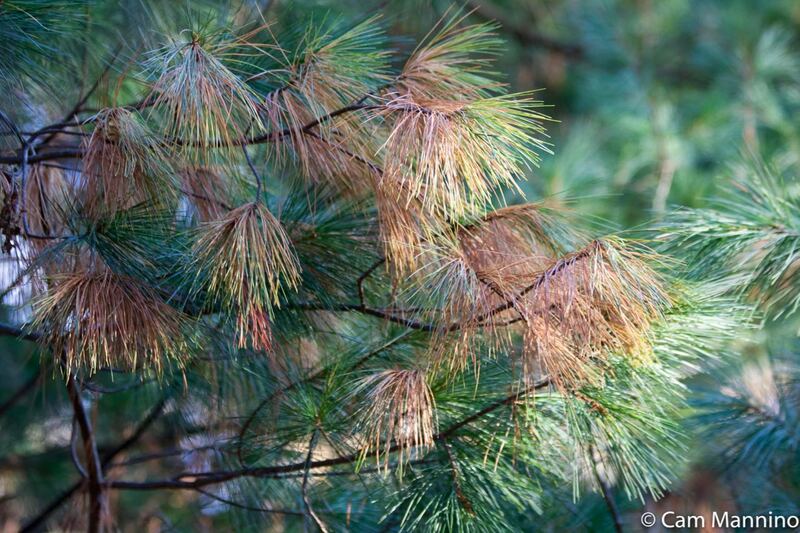 White Pines produce new needles each spring and shed them 18 months later in the fall. The base of a White Pine with seven trunks. The same tree with my husband (5’11”) standing next to it. 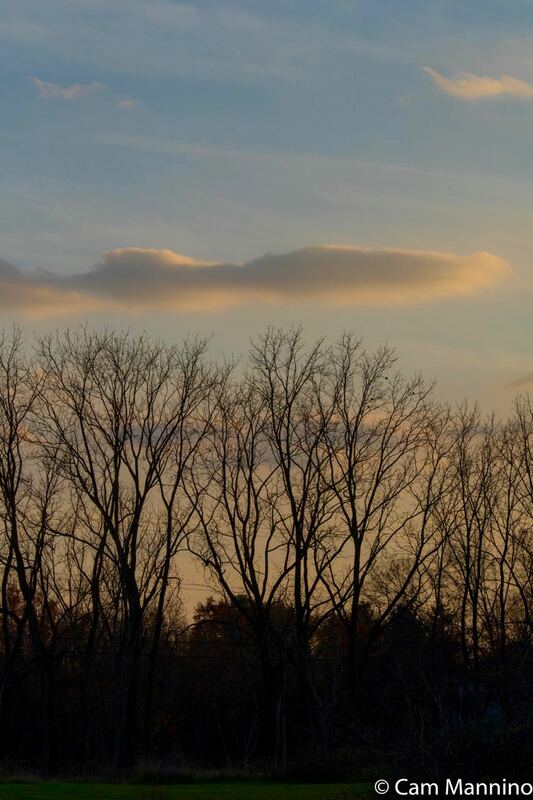 Birds migrating farther south no longer skittered from limb to limb. Instead, our tried-and-true, hardy, year ’round birds – Blue Jays (Cyanocitta cristata), Black-capped Chickadees (Poecile atricapillus) and Mourning Doves (Zenaida macroura) – huddled in shrubs to avoid cold winds or basked on bare branches on sunnier days. And there were the familiar migratory birds of the far north – the American Tree Sparrow (Spizelloides arborea) and the Dark-eyed Junco (Junco hyemalis) – who think Michigan is great place to spend the winter. After breeding in the Arctic, the Tree Sparrow comes to Michigan for its winter vacation. The Dark-eyed Junco raises young in Candada but finds lower Michigan a fine place to spend the winter. Autumn turns us inward, I think. The bustle and color of summer has quieted to more somber grays and browns. Windsong is changed by flowing through dry leaves and bare limbs. A woodpecker drills in the distance; a crow or a jay stridently announces your presence. Now that leaves are underfoot, the trees sleep down in their roots. Turtles and frogs drowse in torpor beneath the water surface. In autumn’s quiet depths, the natural world offers us a place to listen, watch, and maybe just…be. A welcome respite from the hurly-burly of our lives.